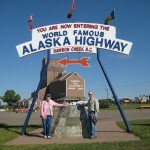 We left Beaver Creek this morning headed toward the Alaskan border (again). No trouble crossing the border. We are starting our 6th week on the road and we still are enjoying every single day. 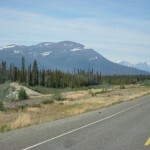 We drove on dirt and gravel roads a good bit of the morning headed toward Tok, and finally Delta Junction. 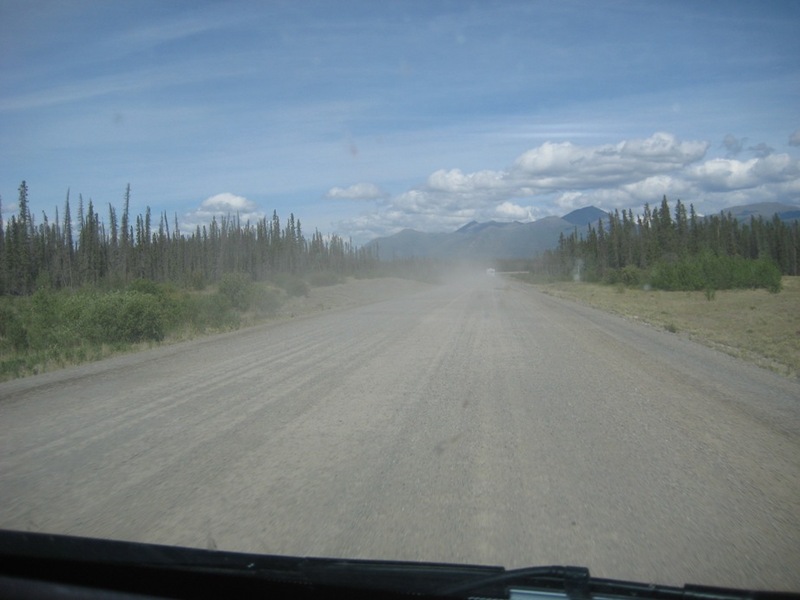 Actually the dirt and gravel is not as bad as the frost heaves, as they will really give you a ride if you aren’t careful. 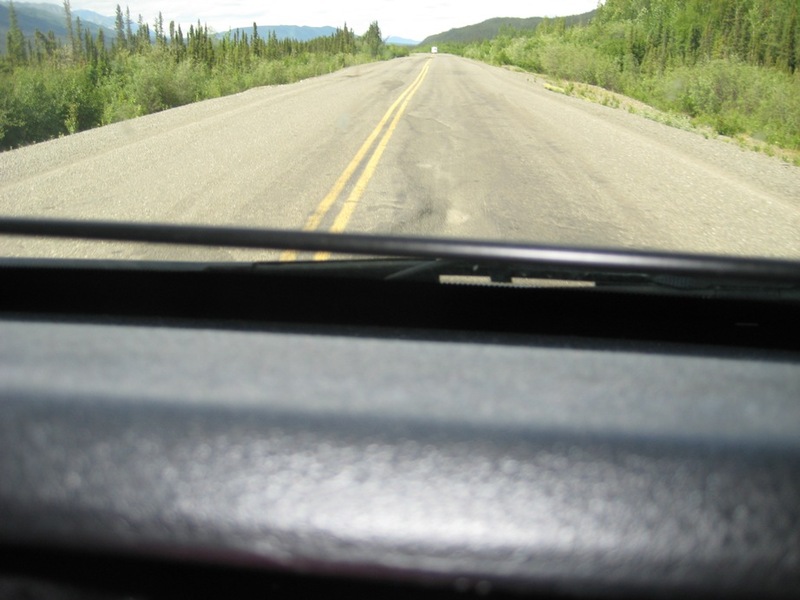 We’ve learned after the first day of driving on them that we must be vigilant and drive slowly. 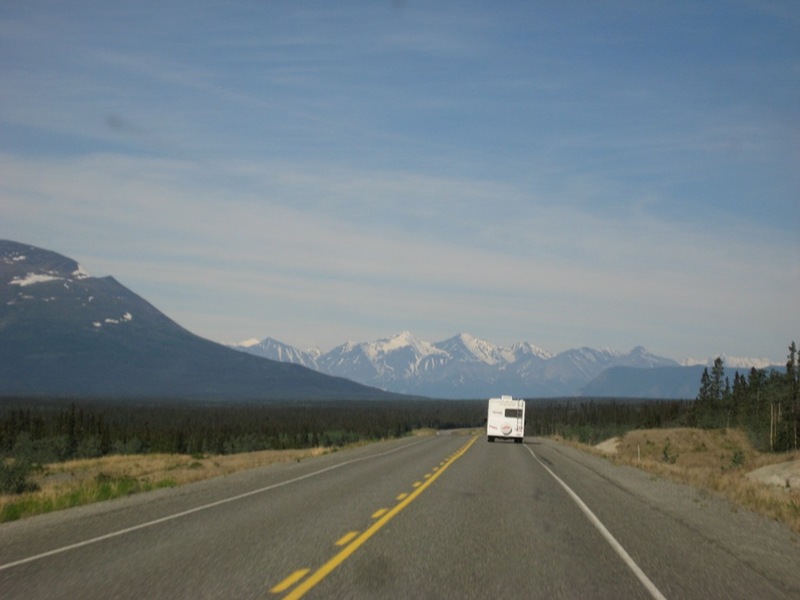 At times there is hardly any traffic behind us or in front of us so we get the feel of the frontier. 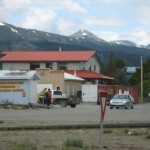 We arrived in Tok at lunchtime and had lunch at “Fast Eddie’s Restaurant”. 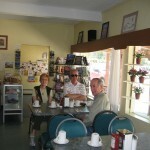 We heard this was a great place to eat and Don and Sandie had eaten there on their last trip. We had a nice lunch of soup and sandwiches. We shopped at a couple of nice little artisan shops and yes I picked up a beautiful mammoth ivory bracelet and earrings. We’ve noticed that a lot of buildings and houses on the side of the roads have been abandoned and boarded up. I think people come and go up here and think they can make it and just cannot. It’s a rugged country and I see how only the strong can survive (isn’t that song?) 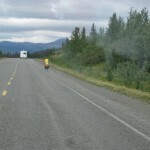 We had rain coming into Tok but the temperatures are moderate. 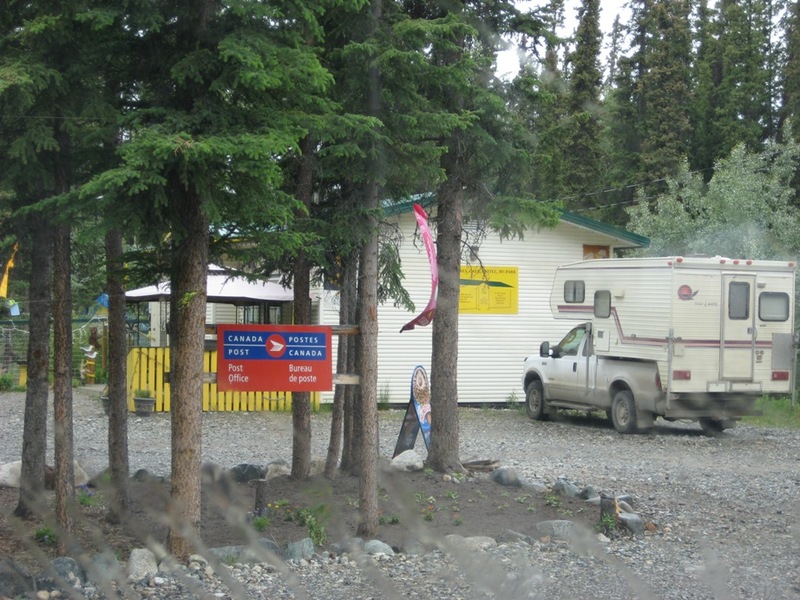 By mid-afternoon we had reached our destination of the day, Delta Junction, Alaska. 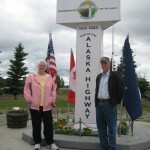 This is also the end of the Alaska Highway. 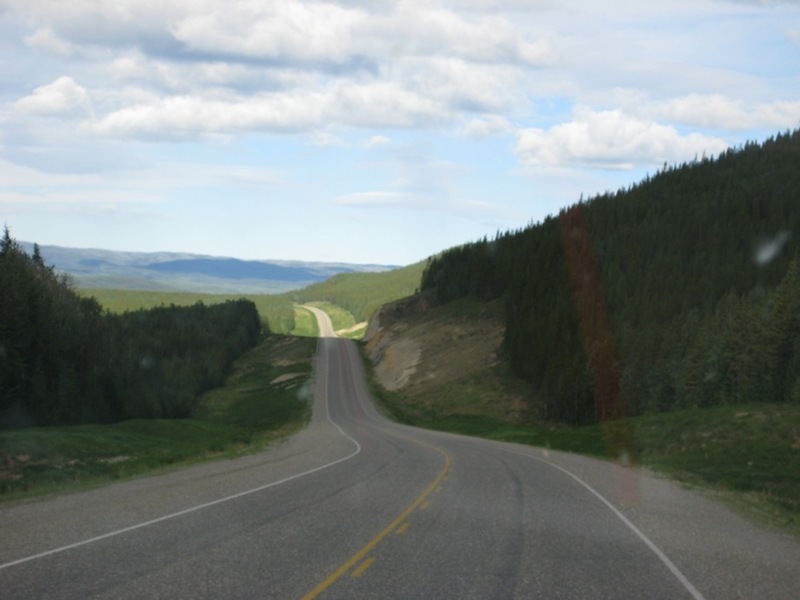 Remember we drove every mile of it, all 1422 miles. Don Fancher has a distant cousin who lives here and they had met once before so we made plans to meet them again for dinner. We drove to their beautiful home. They have lived here for about 30 years. Kirk and Lorraine Ueeck (pronounced eek) have three sons. 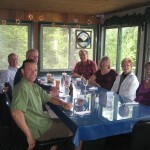 One son who lives near, Kim, and his wife LaRee, joined us for dinner also. Lorraine is a very talented artist and she showed us all of her artwork, crafts, and such. 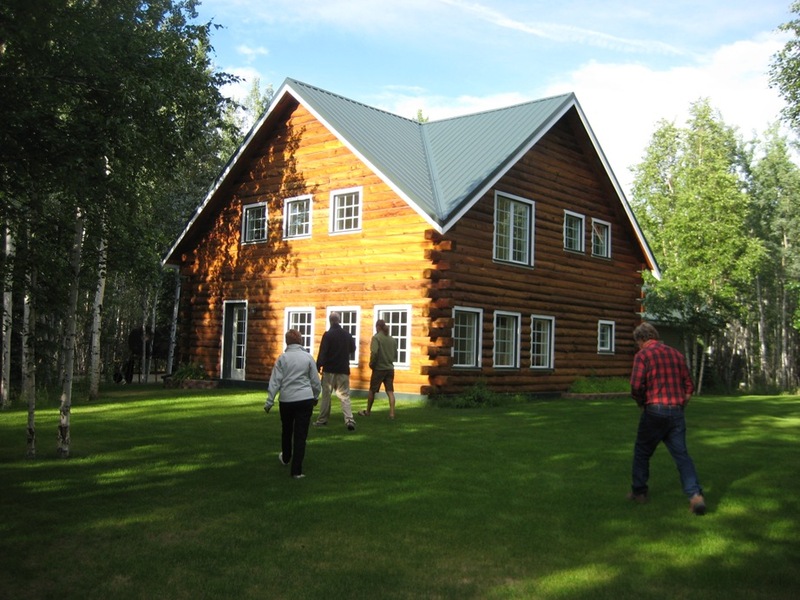 Their home is so interesting—they have a lot of artifacts from years gone by from their families as well as natives they have met in their time in Alaska. Their son, Kim, is also an artist. 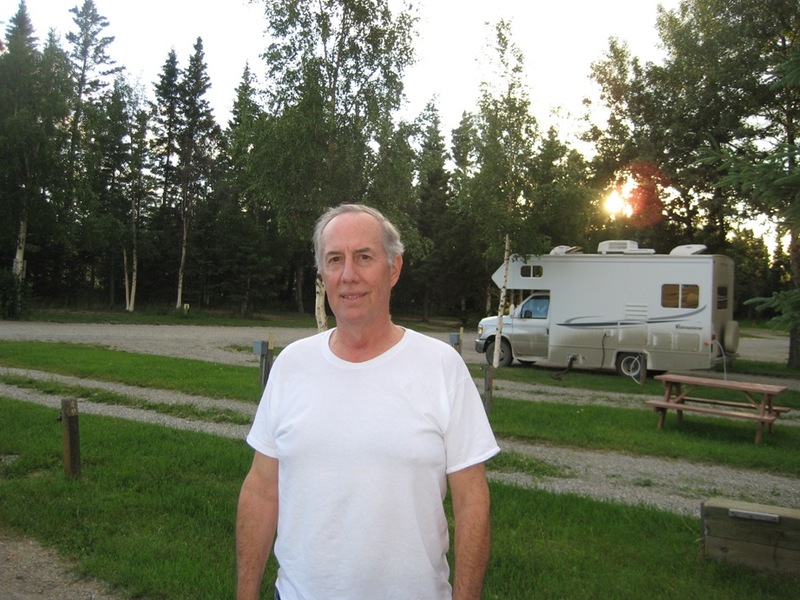 He and his wife LaRee live in Galena during the school year. LaRee teaches school and Kim works for the government during their time in Galena. 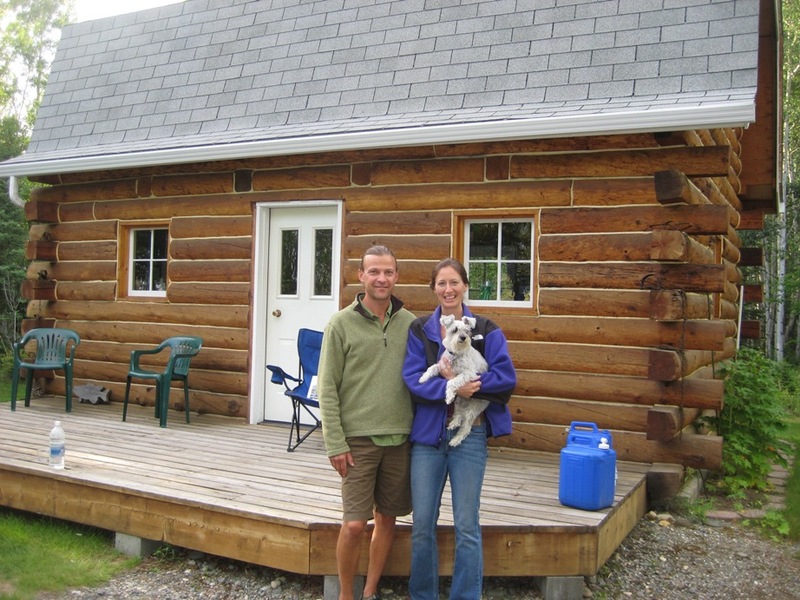 During the summer they move back to Delta Junction where they are building a log cabin. I mean they are BUILDING it themselves. They took us to see it after dinner. 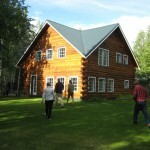 They have 40 acres of property and when we walked through the woods this beautiful 2 story log cabin came into view. You will see it from the photos but I’m not sure the photos will do it justice. 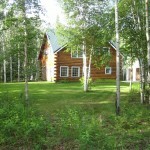 Kim hunts and there are 2 huge moose antlers on the side of the house. 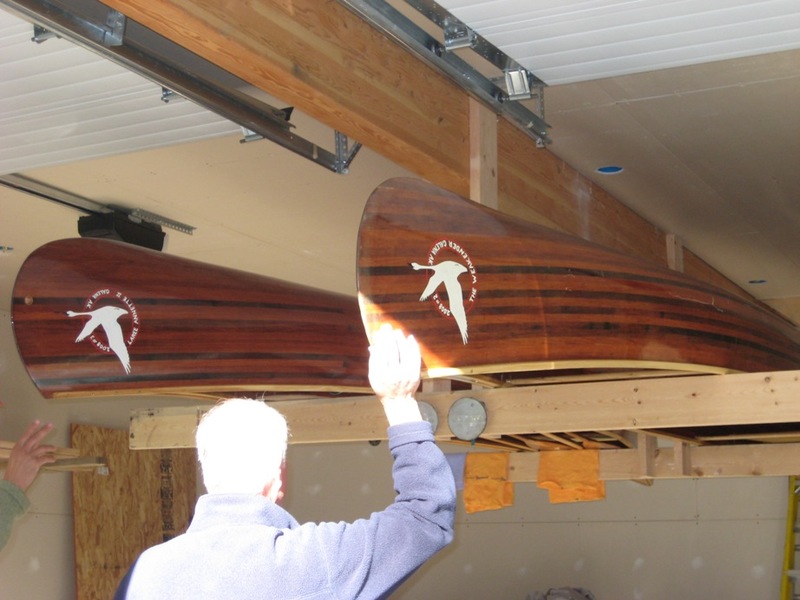 Kim handmakes canoes, the most beautiful canoes you’ve ever seen. And he also does a kind of artwork that is hard to describe. He carves the picture on a piece of birch or some other wood and then in a complicated process tranfers the art from the wood onto paper. I was so taken with his work I bought 4 originals right there from his home. 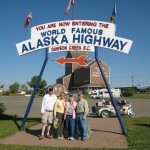 He has also authored a book about the history of his family in Alaska—he gave each of us a copy as well. I must tell you this is one of the most interesting families we have ever met. They were gracious hosts and we enjoyed them immensely. Lorraine processes salmon and she gave both Sandie and I a can of her smoked salmon. 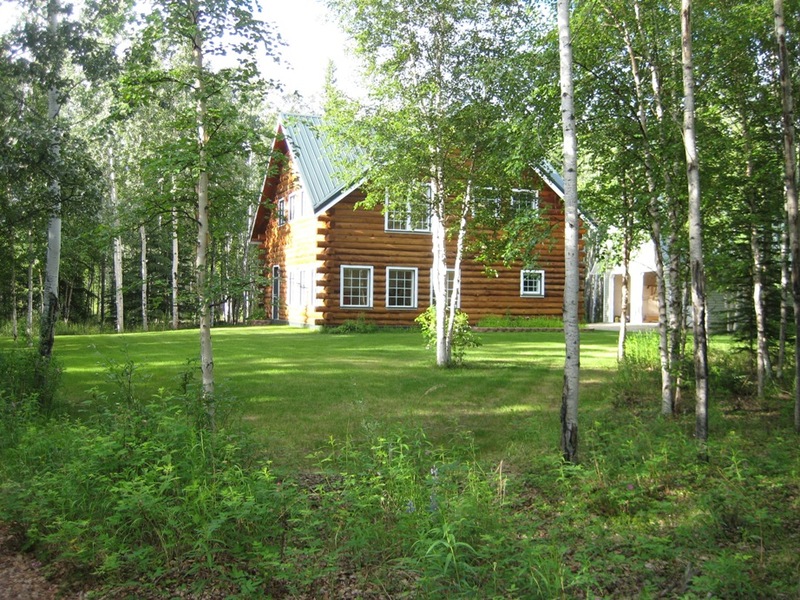 Kim also has a smokehouse and he smokes moose, salmon, etc. I could go on and on about this family but nothing I say can give you the impressions we came away with. 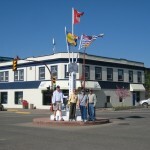 Thanks to all of them for making our visit to Delta Junction a memorable one. We got an early start this morning and our decision was to make it to Beaver Creek by evening. 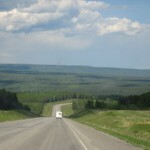 The drive was slow due to the condition of the Alaska Highway. 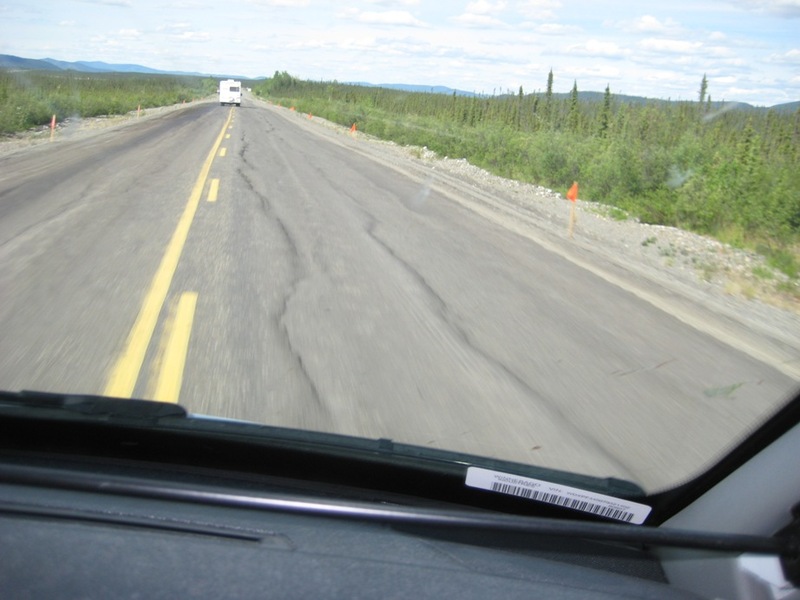 We had several sections of gravel and dirt roads, and the most surprising parts of the road were when we hit the frost heaves. There are warning flags along the sides of the roads, and it’s interesting that although there are flags, it is hard to see the heaves. So if you aren’t careful, you’ll bounce all over the roads (which we did). Our wardrobe door flew open and all hanging clothes fell out. Don and Sandie’s kitchen cabinet flew open and all the stuff inside flew out on the floor. 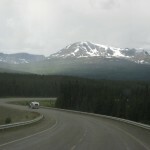 We are driving on the “new” Alaska Highway. This was rebuilt in the early 2000’s. 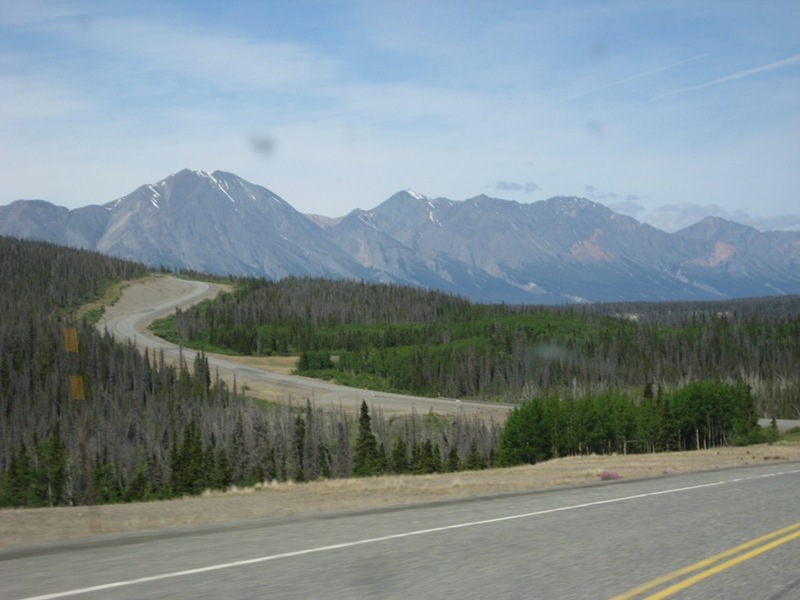 The “old” Alaska Highway parallelled the new road for quite some distance. 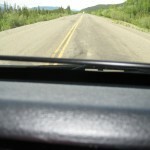 It was interesting to see the road because 30 years ago my parents would have traveled on the old road. Mother’s journals made note of how dusty and muddy the road was back then. 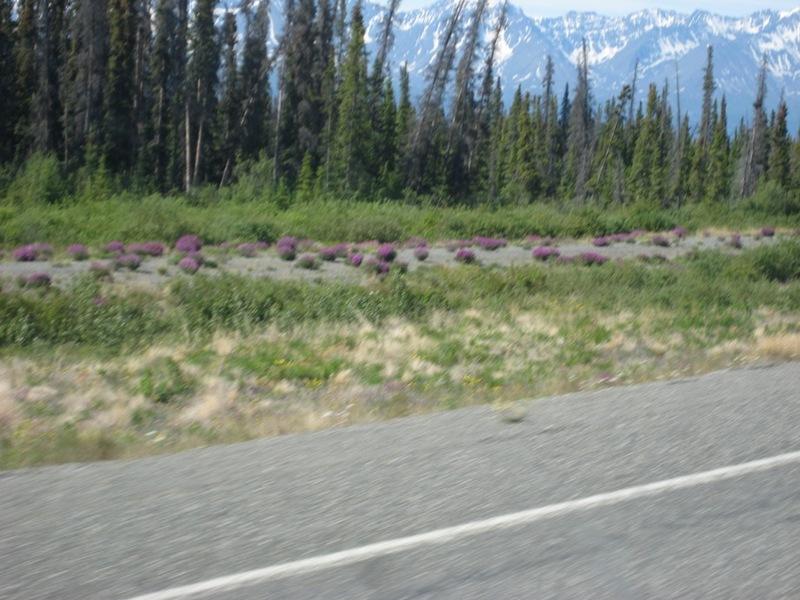 You will notice in one of the photos there are fireweeds all over the old road. 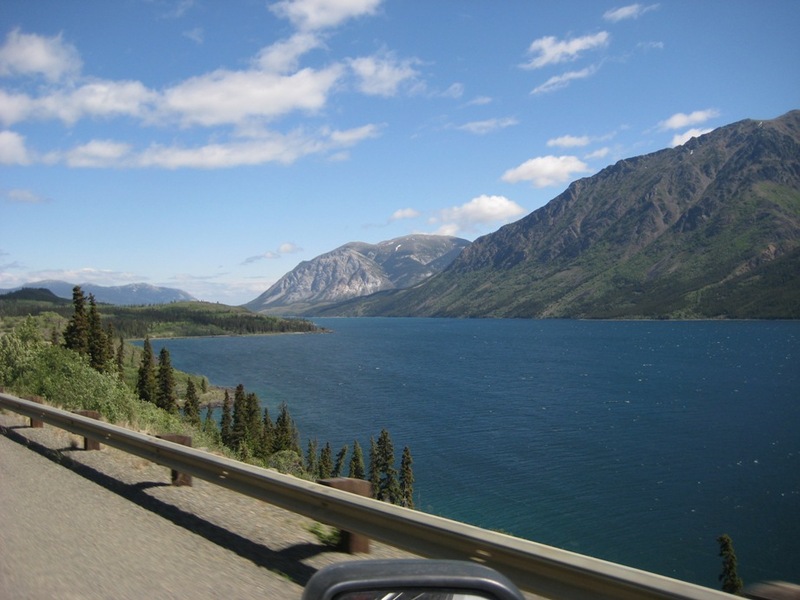 We drove around the beautiful Kluane (pronounced klu-ah-nee) Lake. 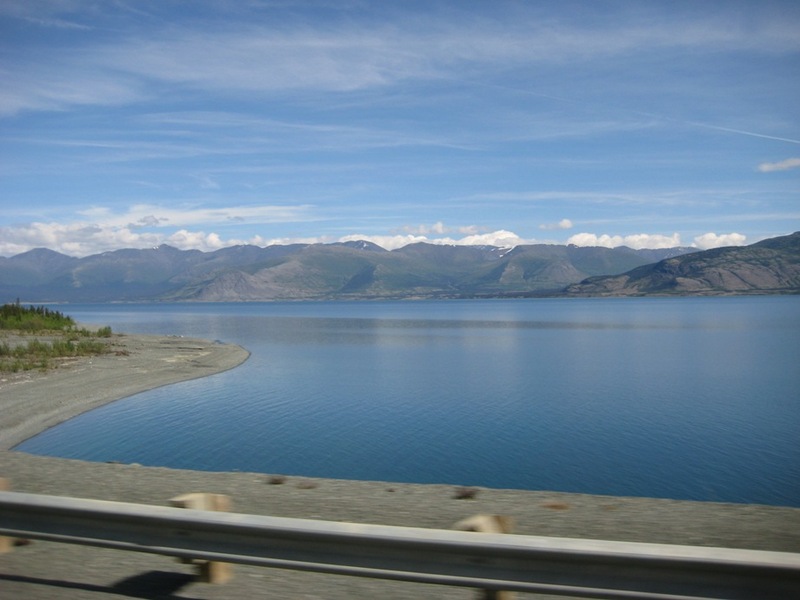 The interesting thing about this lake is that the direction of the current has totally reversed itself due to glacial freezing and unfreezing of the lake. 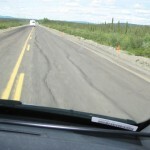 The stone formation in one of the photos will be seen along the roads. 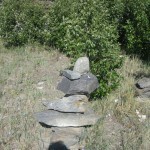 These are indian stacks of stones that are wishing the traveler good luck and peace on their trip. 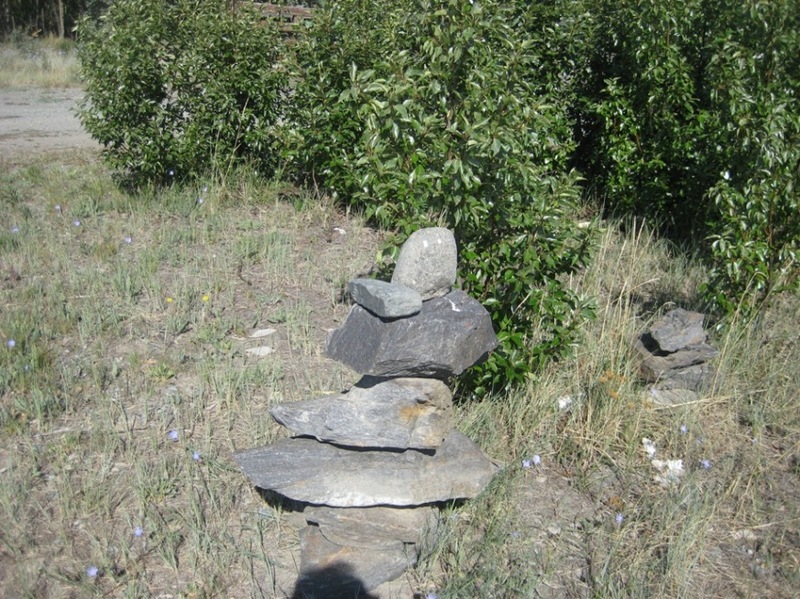 This formation is called “inukshuk”. 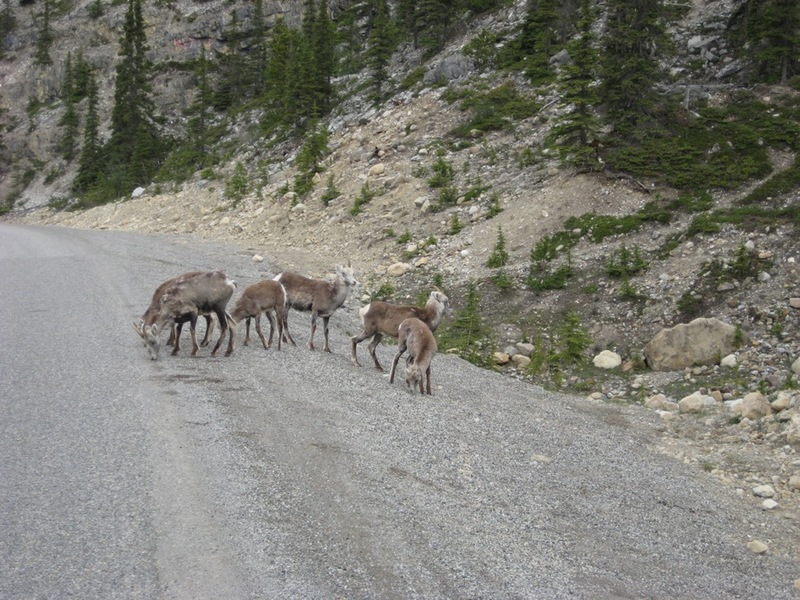 We see them all along the sides of roads as we travel and it feels good to know the natives are wishing us well. 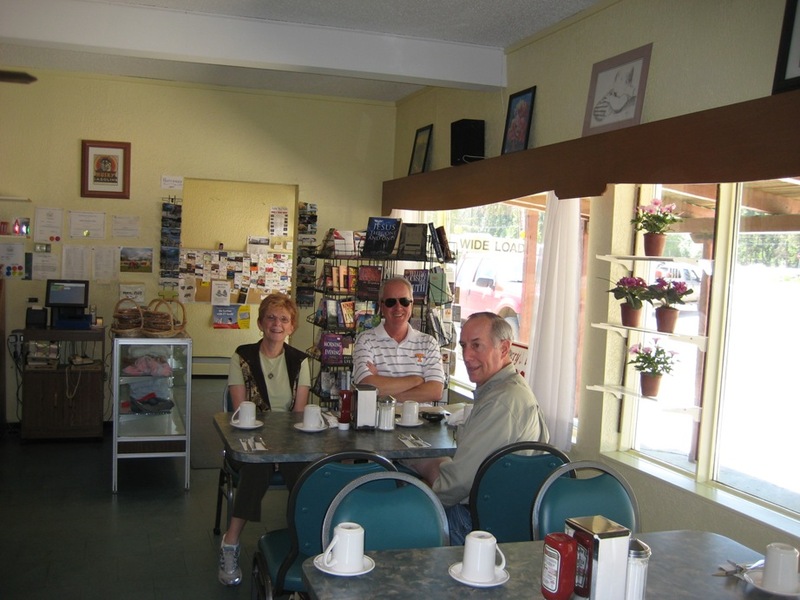 This morning we had a good breakfast and since we had decided to leave the campground at 10:00 a.m., Greg and I walked downtown to do a little shopping. 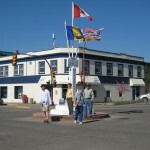 The stores are open early due to the cruise ships being in town. I found a nice Baltic Amber bracelet to match the earrings I bought earlier. We left the campground and stopped by a grocery store for a few supplies. 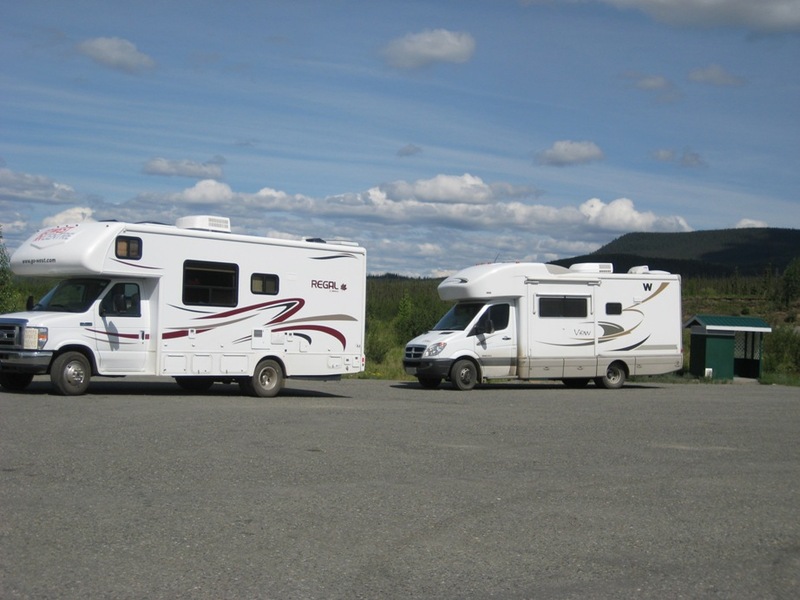 While we were getting back into the RV, a couple walked up to us and said they had a View also and noticed us and had to come over to say hello. 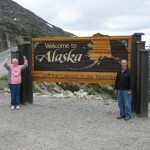 They are full timers but were on a cruise to Alaska. They got tickled at how dirty the RV was. 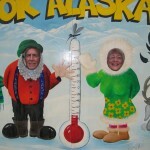 They had also been to Alaska in their RV and remembered what theirs looked like. They were from Texas. 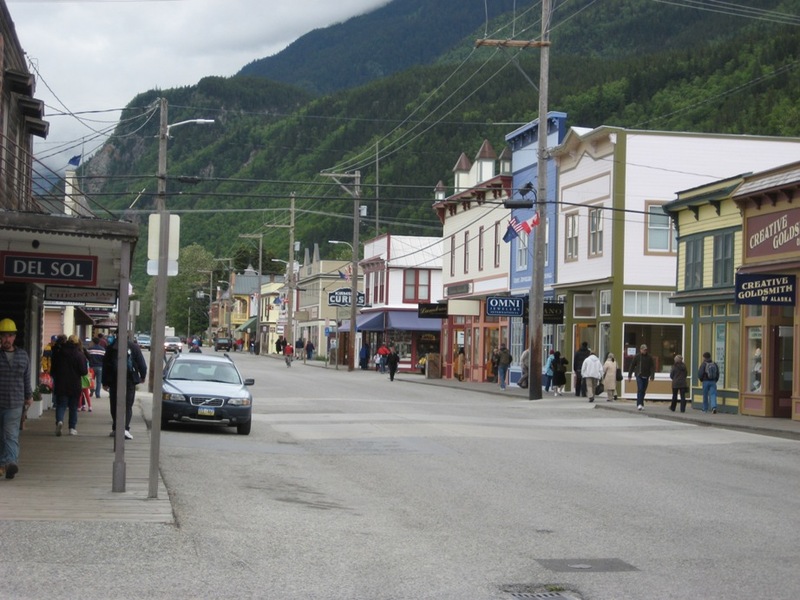 Well I’ll say this—we will try to stay away from these little tourist towns for the cruise ships like Skagway. It was a pretty little town but when the rush of cruisers came into town, they just overran it. (No offense to all you cruisers) Most of the shops had t-shirts and such. 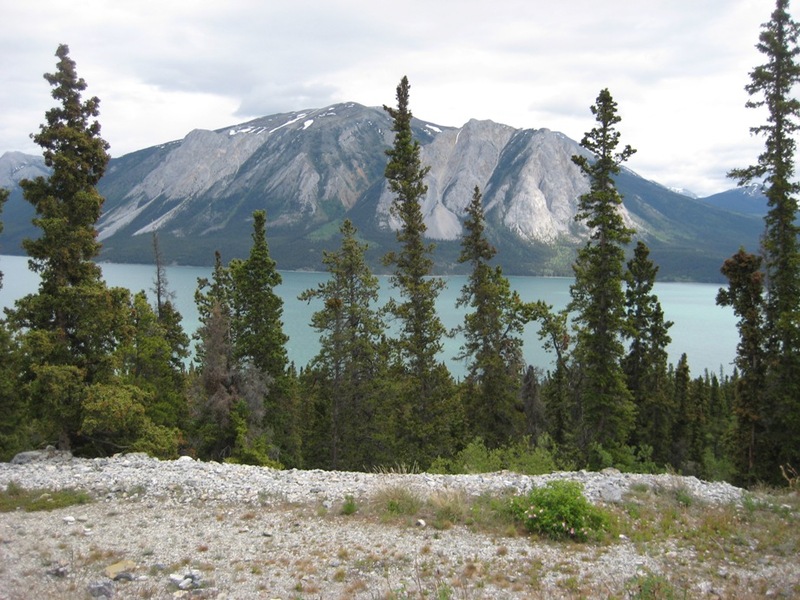 We would much prefer the more wilderness areas where there are not a lot of tourists. 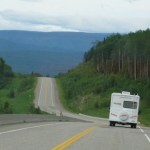 We crossed back into the Yukon today on our way to Whitehorse. 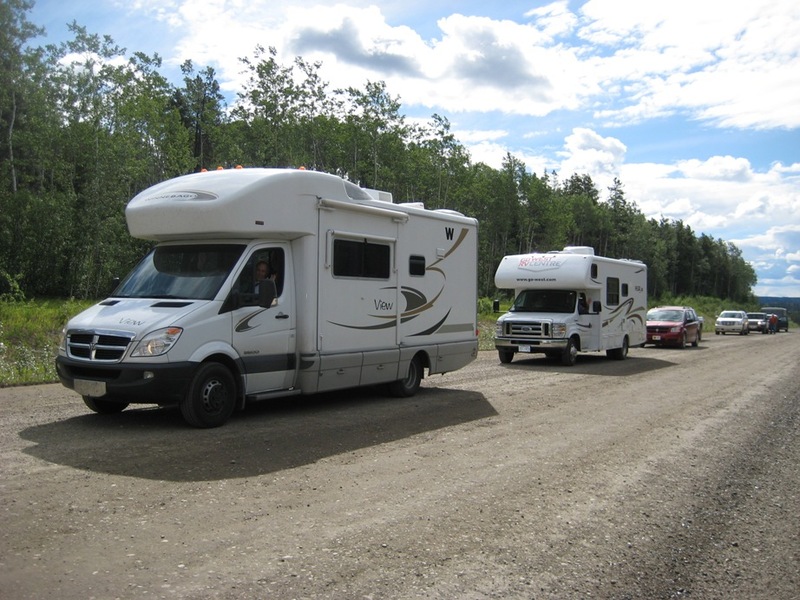 We found a nice little campground on the edge of town and rested a while before heading back into the town to visit the SS Klondike. 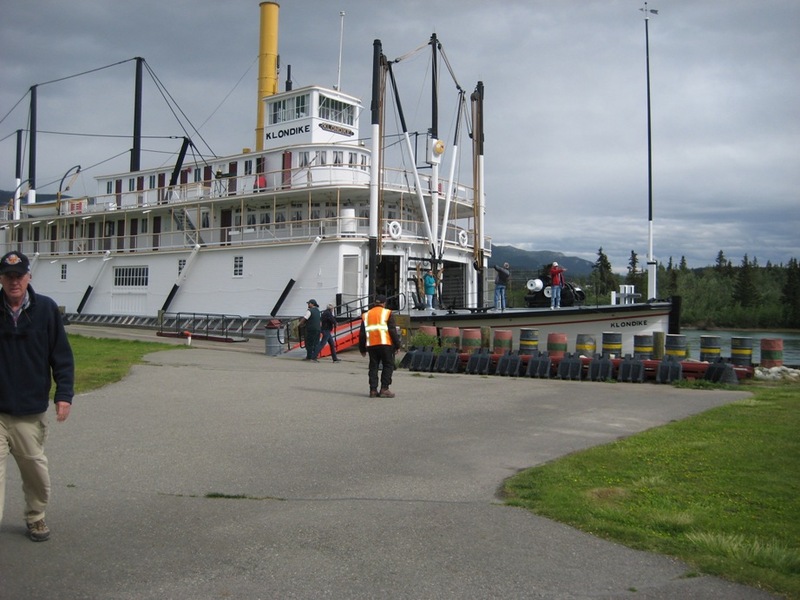 This is an old sternwheeler that carried supplies up and down the Yukon River until it went out of commission in the mid-1950’s. It was interesting to see the old boat and all the things that were carried on it. 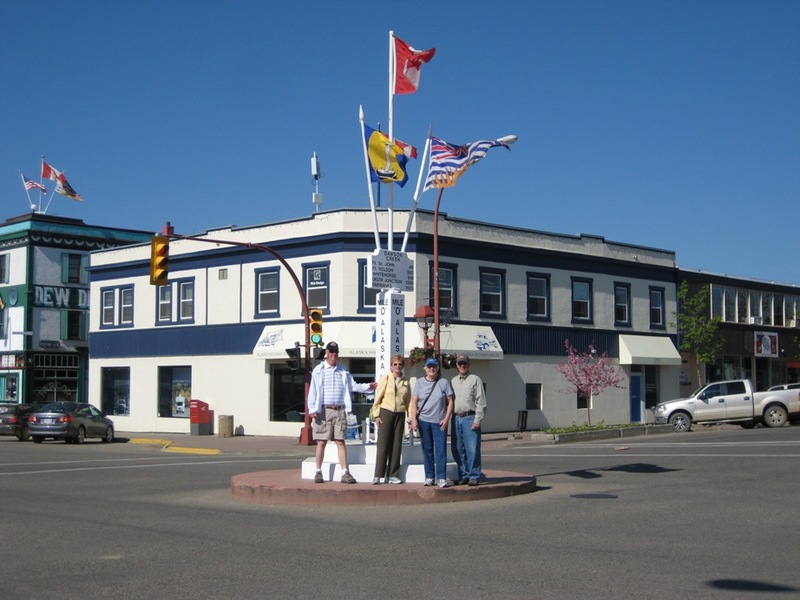 After visiting the Klondike, we had dinner at the Klondike Salmon and BBQ restaurant. It was very good and you’ll see what the restaurant and food looked like by the photos I’ve posted. 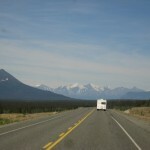 We will hit the road again in the morning heading toward Destruction Bay. 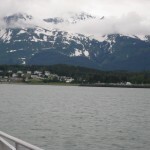 This morning we boarded the Catamaran at 7:45 a.m. for our trip to Juneau. We were excited about the trip but had no idea what a fantastic trip it would be. 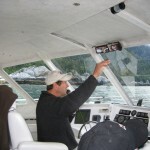 The captain of the boat, Glenn, was the most animated tour guide we’ve ever encountered. 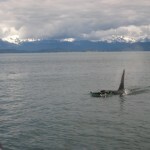 He truly loves what he does and it showed in the way he guided us through the waters on our way to Juneau. 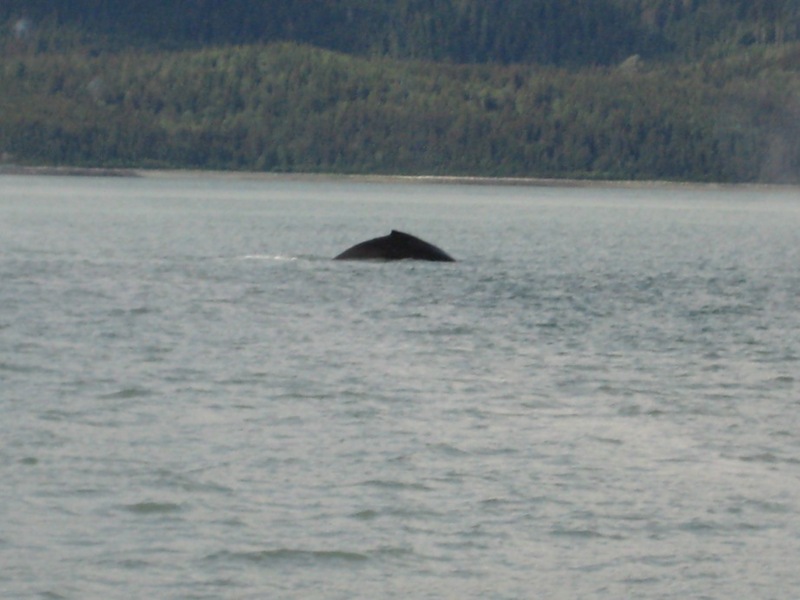 After stopping in Haines to pick up a few passengers, we headed out into more open water. 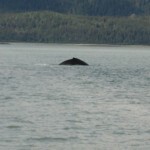 Almost immediately Glenn told us to watch for “blows”, meaning blows from the humpback whales. 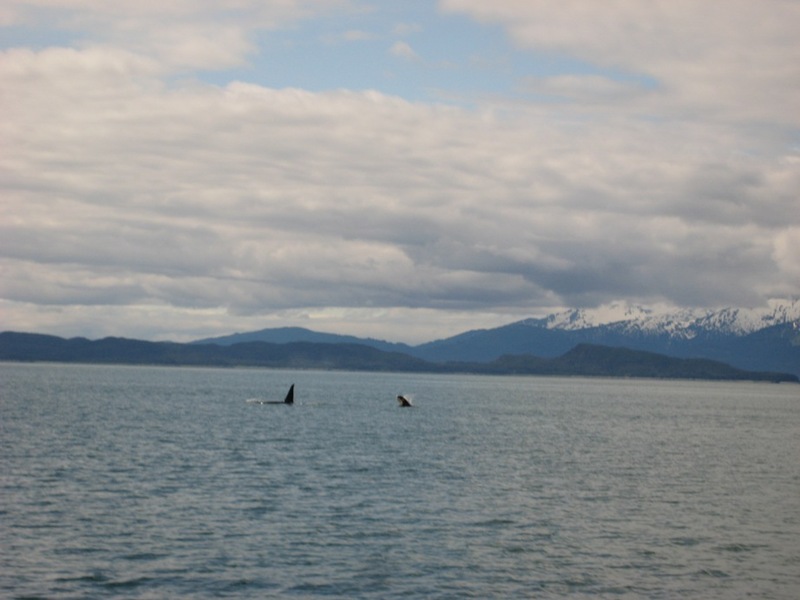 I was skeptical at first because it seemed too good to be true that we may actually see whales in the wild. Well what a day we had. 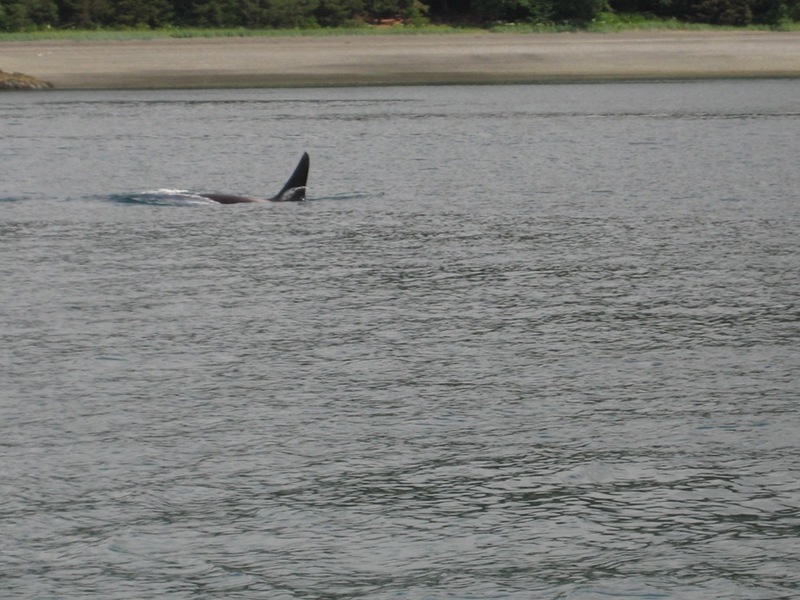 The entire boat (about 40 of us) became fast friends as we all watched for “blows” and yelled when we saw them. 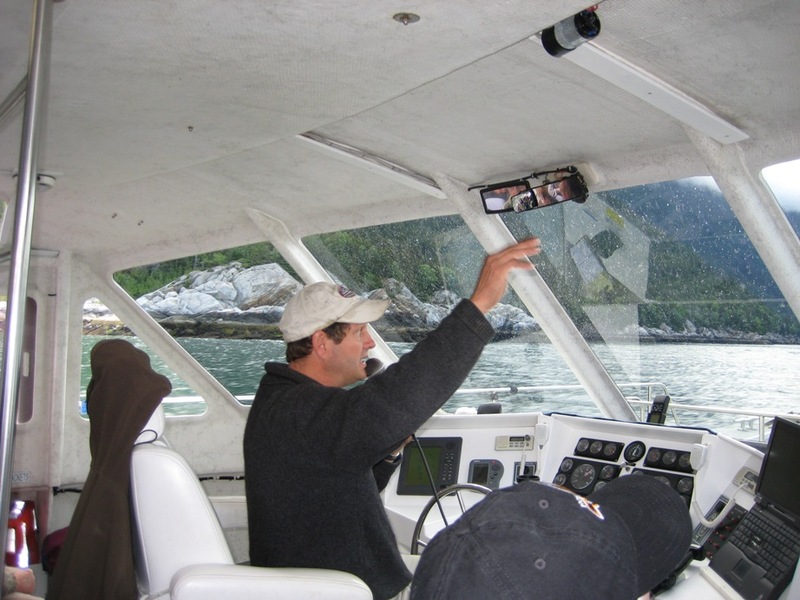 The boat captain would slow the boat, circle the whales, and we would get a real show. They would jump and flap their tails and then dive. 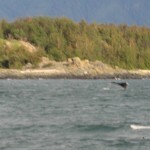 It is extremely difficult to catch this activity with our digital cameras but we got a few good shots. But the photos aren’t anything compared to seeing it for real. 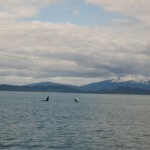 The first half of the trip we saw mostly humpback whales, and then as we moved closer to Juneau, we ran into pods of orcas. They have white on their bodies and they don’t dive like the humpbacks. They have fins, too. 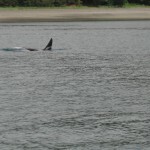 We saw Mothers and baby orcas. 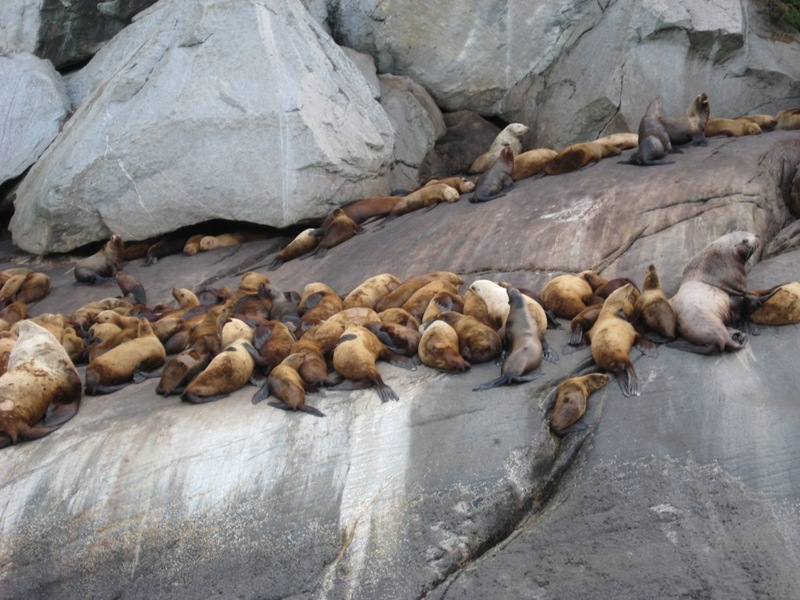 We saw a wall of sea lions on rocky cliffs. Unbelievable to see all this up close. 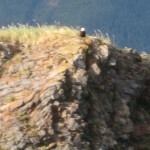 Another unexpected viewing was that of many bald eagles. 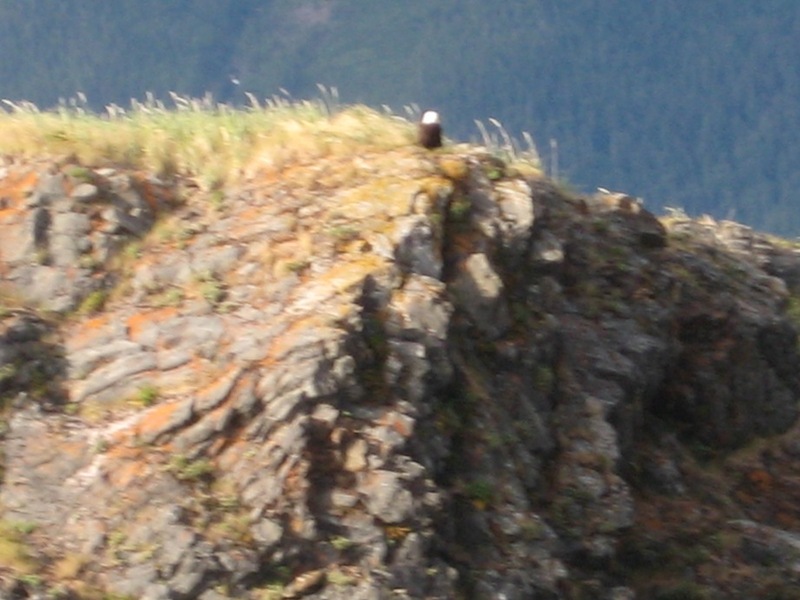 There were lots of eagles on the site of a lighthouse, one of only three in the entire state of Alaska. The eagles and their babies were flying all around the tiny island. 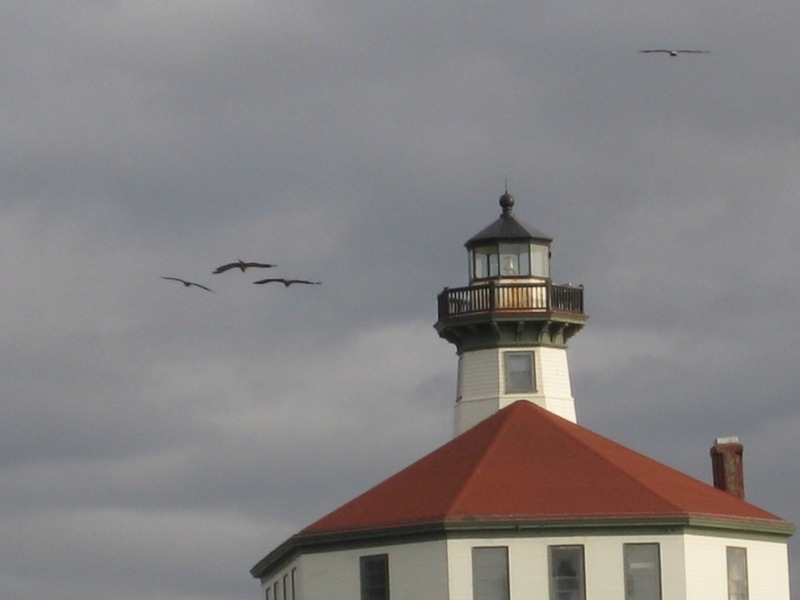 We took photos of the eagles in flight soaring around the lighthouse. 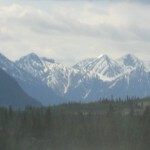 We were served a blueberry muffin, coffee, and juice on the way to Juneau. 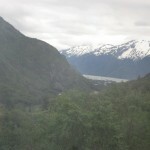 When we arrived at our drop-off point, a bus picked us up and took us into Juneau. 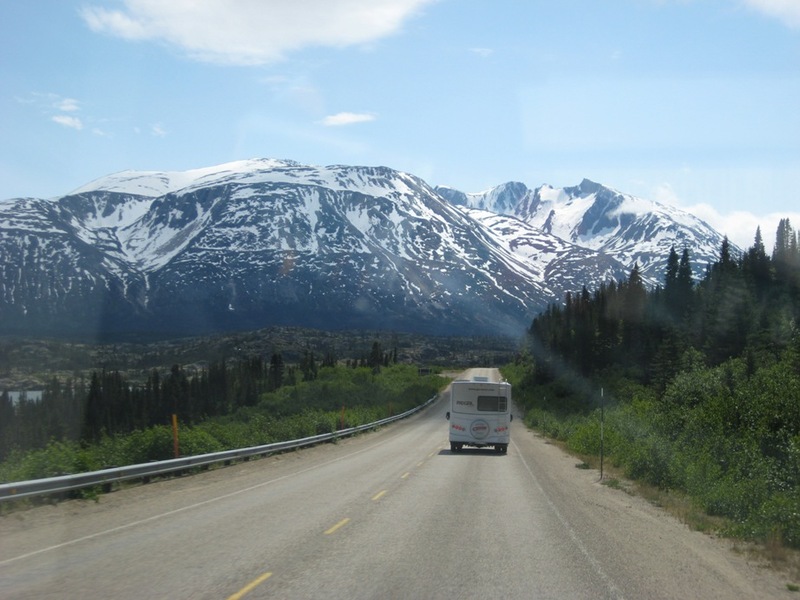 The driver of the bus, McKay, was a college student from Utah State University working as a tour bus driver during the summer months. He is majoring in music therapy. What a great kid he was. 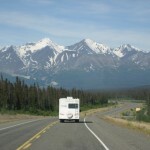 Since the drive into Juneau was around 30 miles, we got to know the driver quite well. 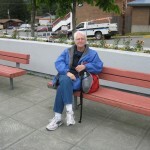 He was a very animated tour guide and gave us all sorts of information about Juneau before we arrived there. 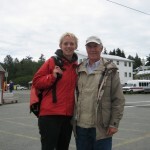 He dropped us off at the port where all the cruise ships dock. We saw the governor’s mansion, which was right down town. No wonder Sarah didn’t want to be governor for long. We had lunch at a restaurant called “The Hangar” which was actually in a building on the dock that used to be a plane hangar during WWII. We had a very good meal. 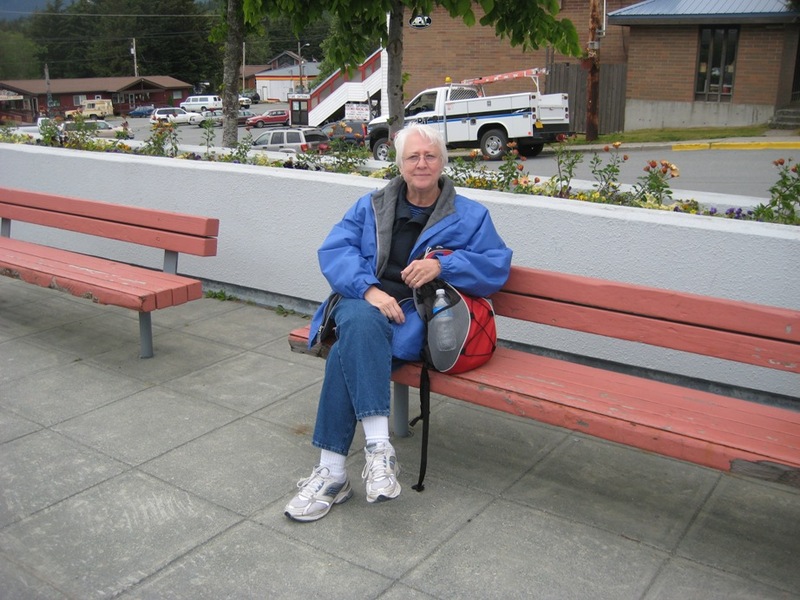 We walked around downtown Juneau for a couple of hours and then the bus driver picked us up to take us back to the dock where we met the Catamaran for the ride back to Skagway. McKay told us the story of how the Alaskan flag was chosen and how the words to the state song were written. Then he broke out in song singing the state anthem. He was an excellent singer and spoke eloquently about his chosen vocation of music therapy. I feel sure McKay was well “tipped” from this group. He was a real jewel and is working to pay his way through college. 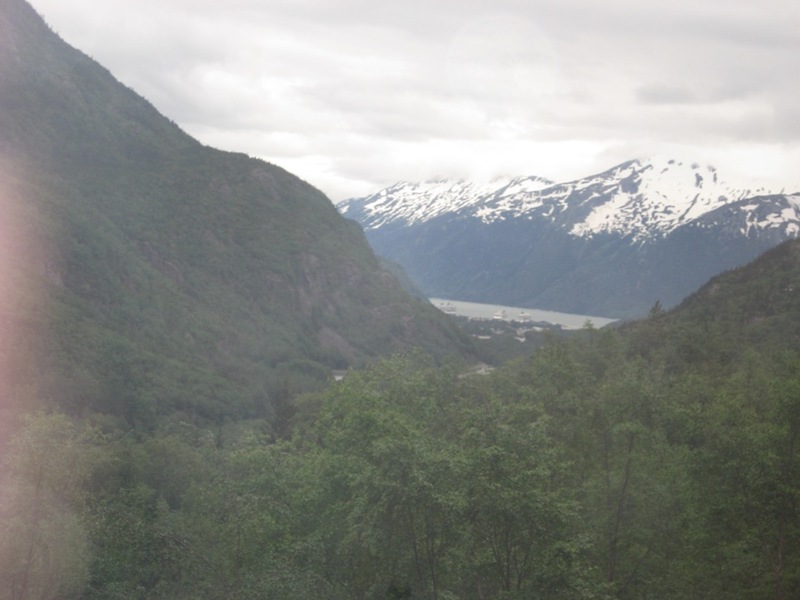 Before he dropped us off at the catamaran, he took us to the visitor center for the Mendenhall Glacier. 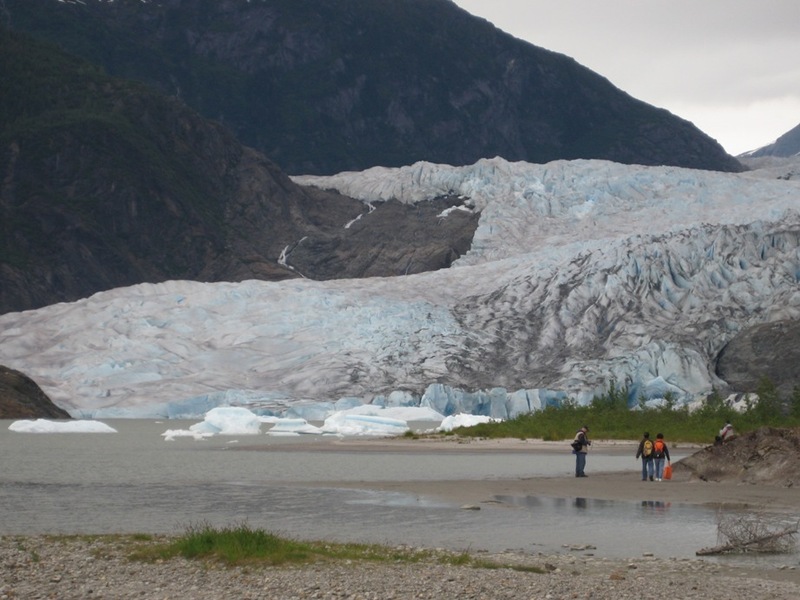 This glacier is unusual because you can get so close to it. 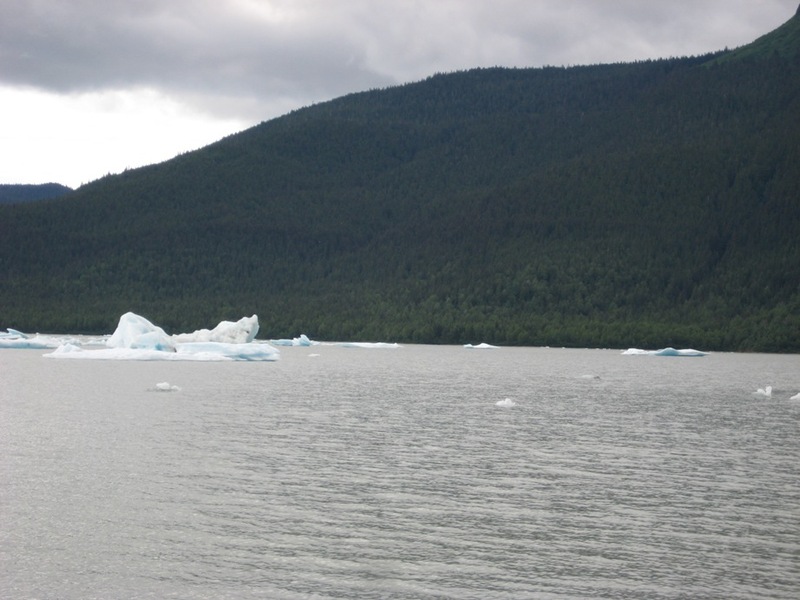 Over the years due to global warming, the glacier is receding. 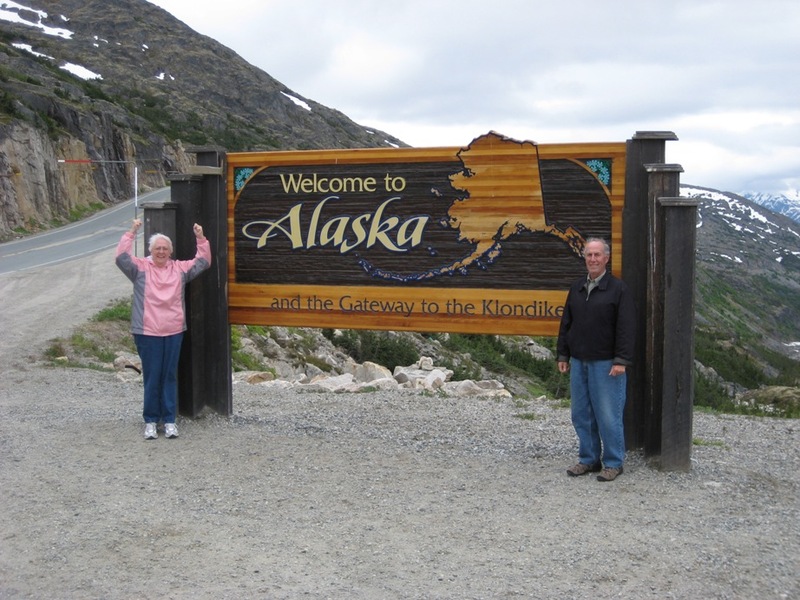 The interesting thing for us was that we had a photo of the Mendenhall Glacier that my Mom and Dad took when they visited Alaska 30 years ago. 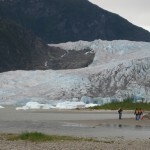 I took our photos from the same spot as they did and you can certainly see how far the glacier has receded. 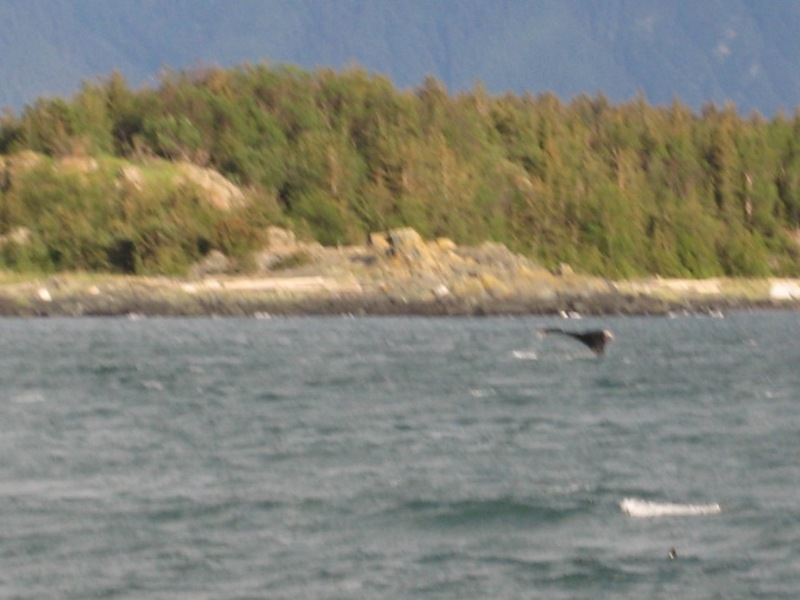 On our ride back to Skagway,we were treated to more whale sightings and a group of dolphins ran with the catamaran for a while. 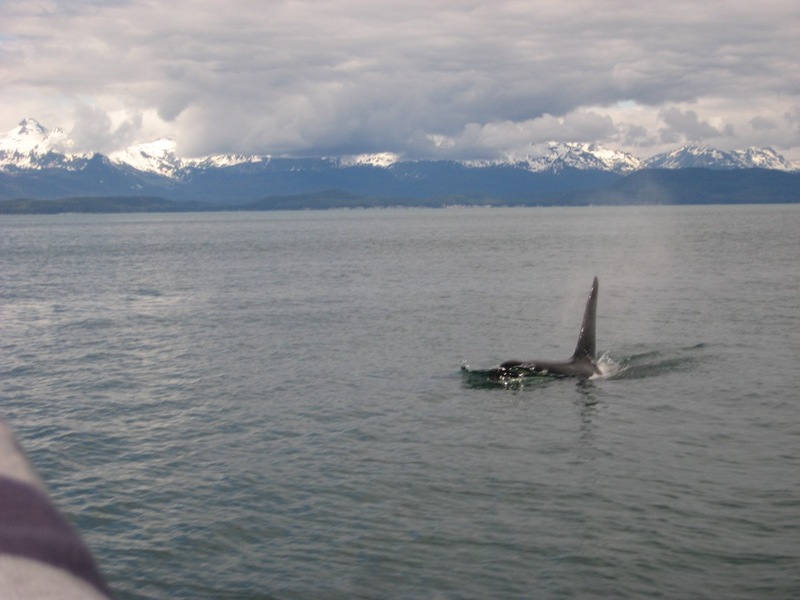 They ran right between the two bows of the catamaran. 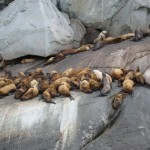 We saw sea lions again and had a wonderful ride home. 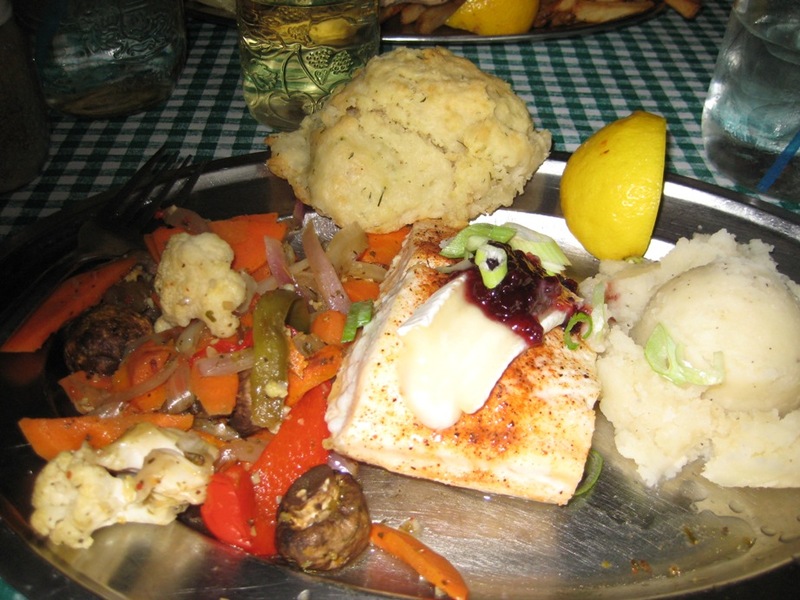 We were served a hot bowl of smoked salmon chowder, a dinner roll, and a chocolate chip cookie. If any of our remaining days on this trip are as special as today, Greg will have to sedate me. How much excitement can one gal take? Allan asked us this week if the trip has met our expectations. You know our expectations were high, because we’ve planned it for so long. Well I can tell you that the trip surpasses our expectations. We have enjoyed every single day and look forward with excitement to each new day. 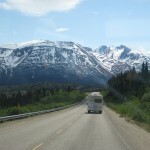 Tomorrow we head out to Whitehorse, Yukon territory. 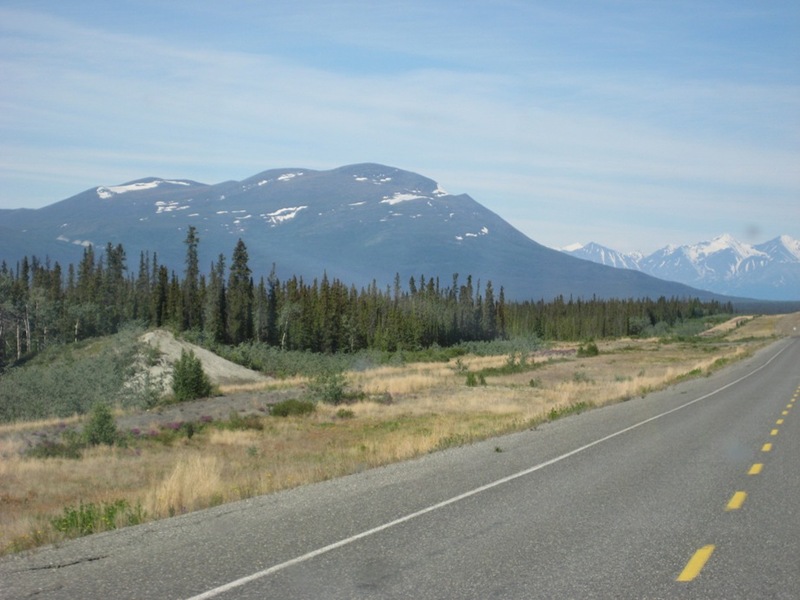 If you can picture the roadmap, in order to get to Skagway you turn off the Alaska highway and drive 50 miles or so toward the ocean and the only way out of Skagway is to backtrack back into the Yukon. That’s the way it is in this area. Many towns have one road in, and one road out. 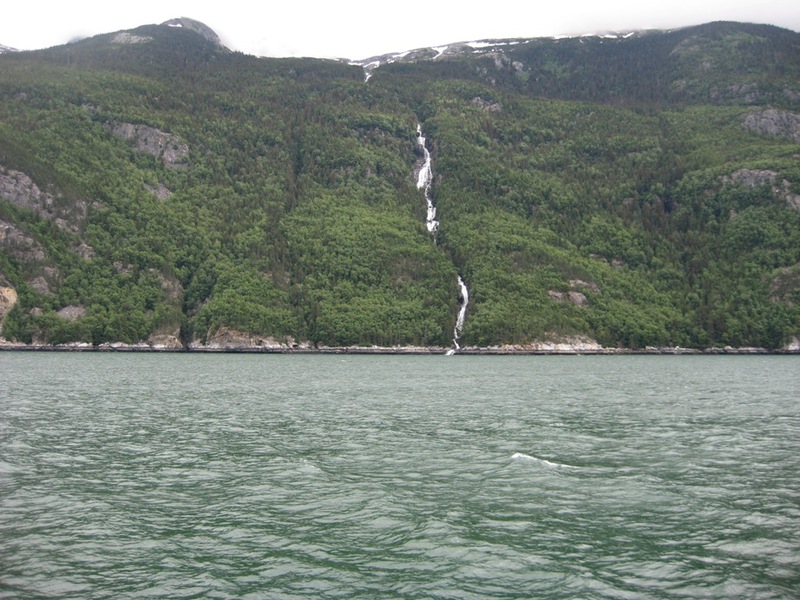 For instance, by water, it is 15 miles from Skagway to Haines. By road, it is 350 miles. 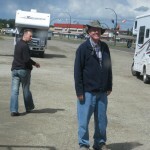 After our laundry finished we walked back to the RV to put away the clothes, then had lunch while in the RV, and then we walked back into town to do more shopping. 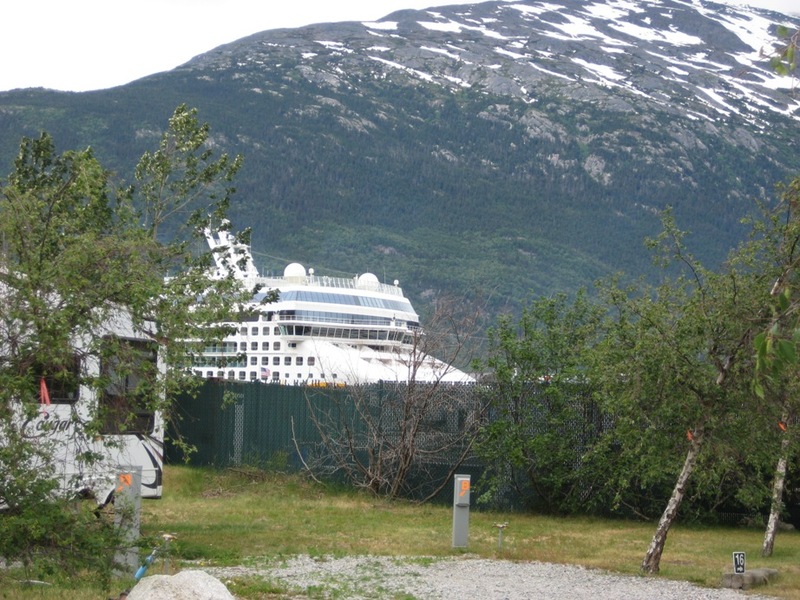 We were told that Wednesday was the most crowded day in Skagway because five cruise ships are docked for the day. And they were right–there are so many people in town you can hardly walk and it certainly wasn’t conducive to shopping. So after an hour we just walked back home. We rested and I made peanut butter sandwiches to take on our train ride this evening. 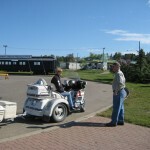 We walked over to the train station to board the train around 4 p.m. What a great adventure we had on the railroad!! 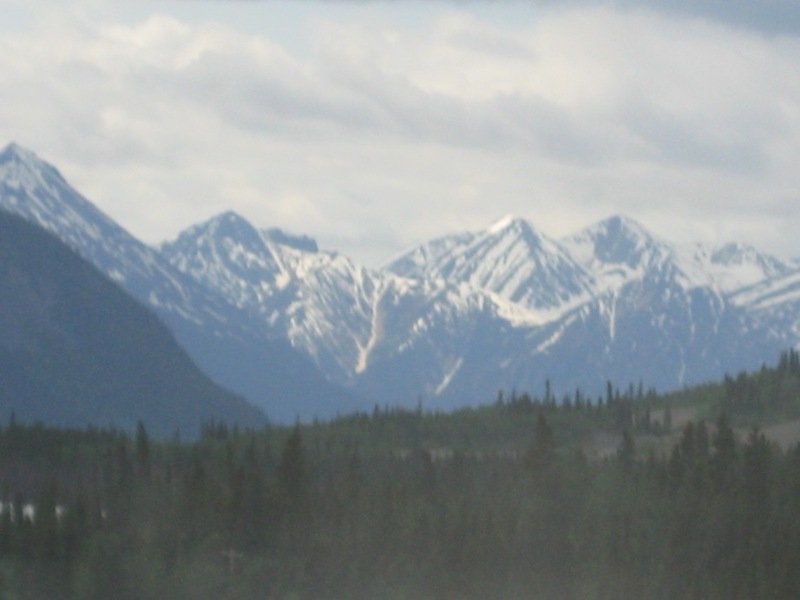 The White Pass railroad was built in 1898 because someone decided to find an easier route over to the klondike during the gold rush. 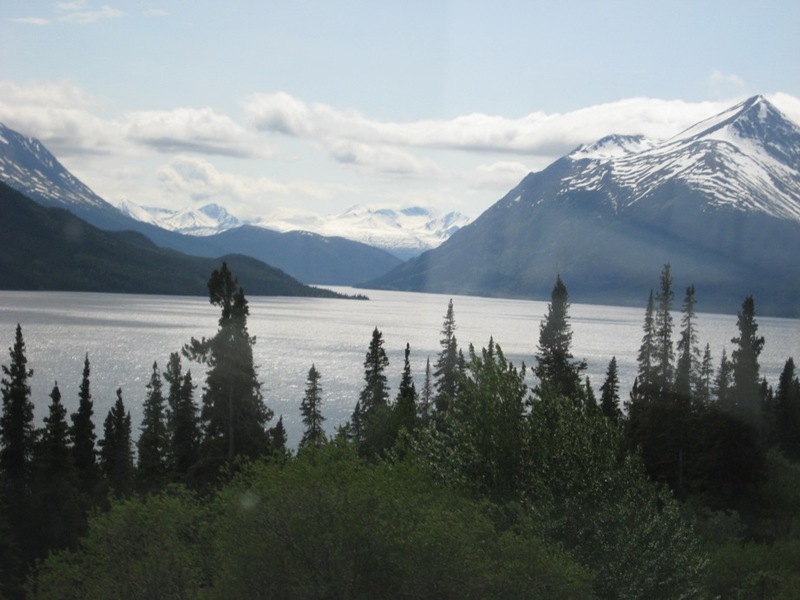 Before this railroad, the Chilkoot Pass was used to get to the klondike. 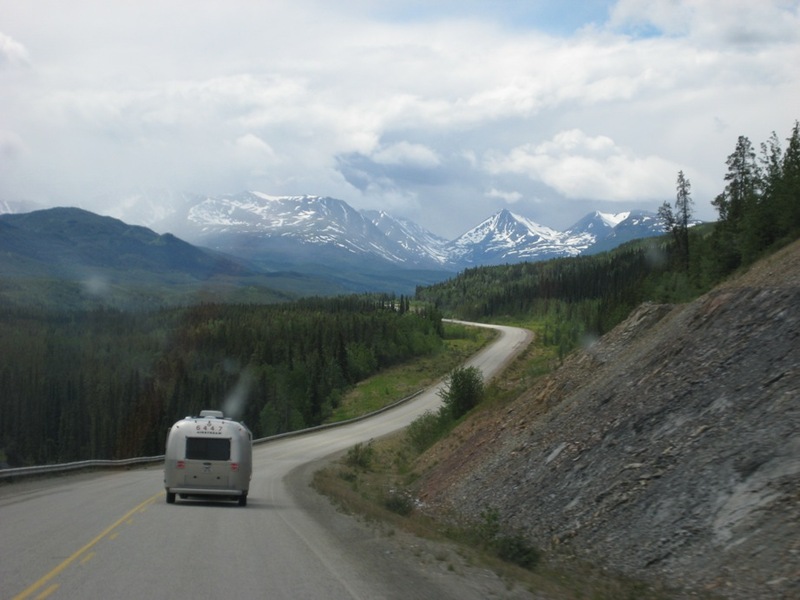 It was so rough and rugged they thought anything would be easier than the Chilkoot Pass. 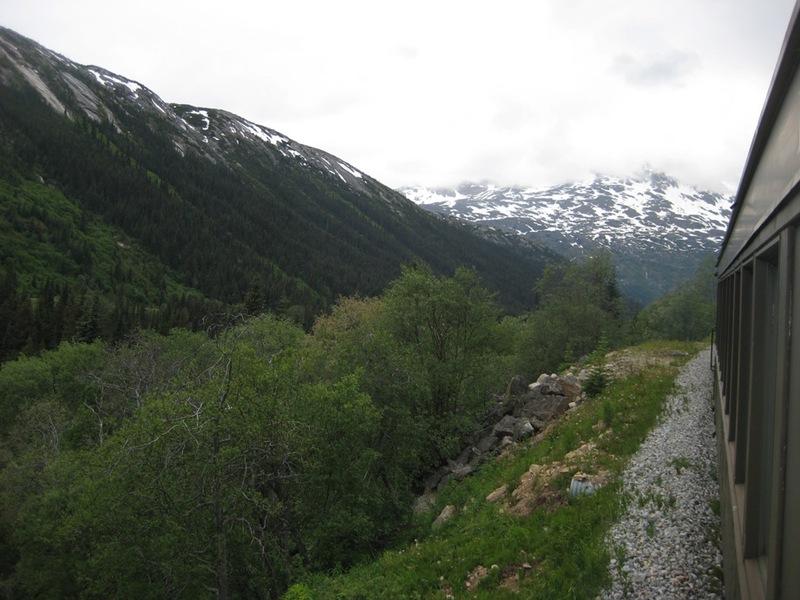 This railroad was built in 2 years, using thousands of workers who shoveled, blasted, and dug their way over the White Pass Summitt. 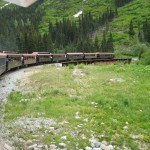 The railroad is a narrow gauge, meaning there are only 3 feet between the rails. They built it as a narrow gauge simply because it would have taken more work and time to build a regular rail. 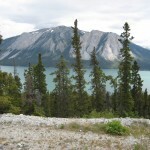 Our excursion went up to Summitt Pass and back to Skagway. On one side of the train the wall of rock was so close to the train it seemed to be less than 6 inches away. The other side of the train had such a dramatic drop you couldn’t even see the rail or the ground under you. Some of the turns were so sharp you could see the front and the back of the train (there were 12 cars) at the same time. It was a harrowing journey but so interesting. 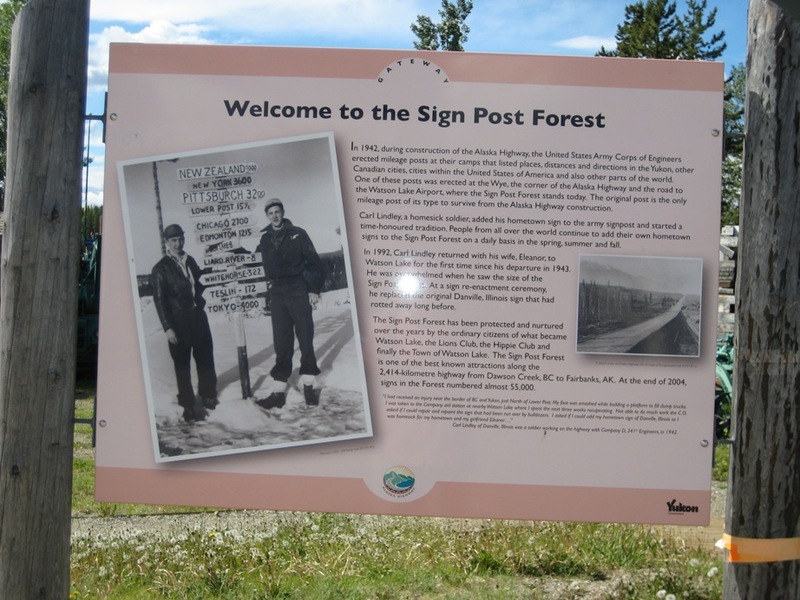 We saw the original mule pack trail where the gold diggers traveled trying to make it by foot over the Pass. The mules were worked to death and would fall dead in their tracks. 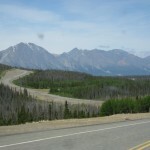 That area was called “Dead Horse Gulch”. Over 3,000 pack animals died, victims of being overloaded and overworked by the greedy gold diggers. 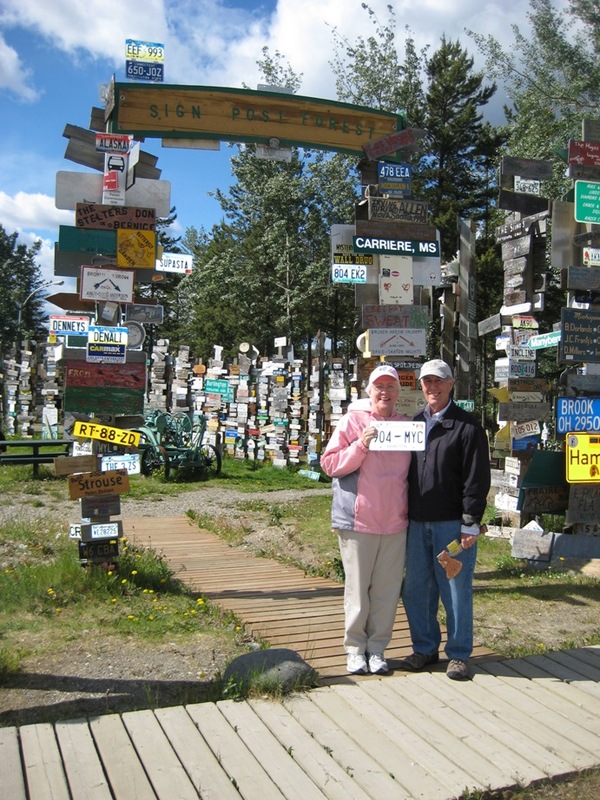 We saw the Gold Rush Cemetary, which was the early resting place for Skagway residents. 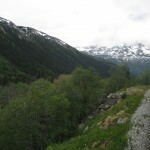 Gold Rush gangster Jefferson Randolph “Soapy” Smith and hero Frank Reid died in a final shootout and were buried there. 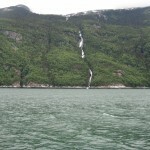 We passed Bridal Veil Falls, which cascaded 6,000 feet from the glaciers on Mt. Cleveland and Mt. Clifford. We saw Black Cross Rock, where on August 3, 1898, a blasting accident buried 2 railroad workers under a 100 ton granite rock. The black cross marks their final resting place, and it is still there today. 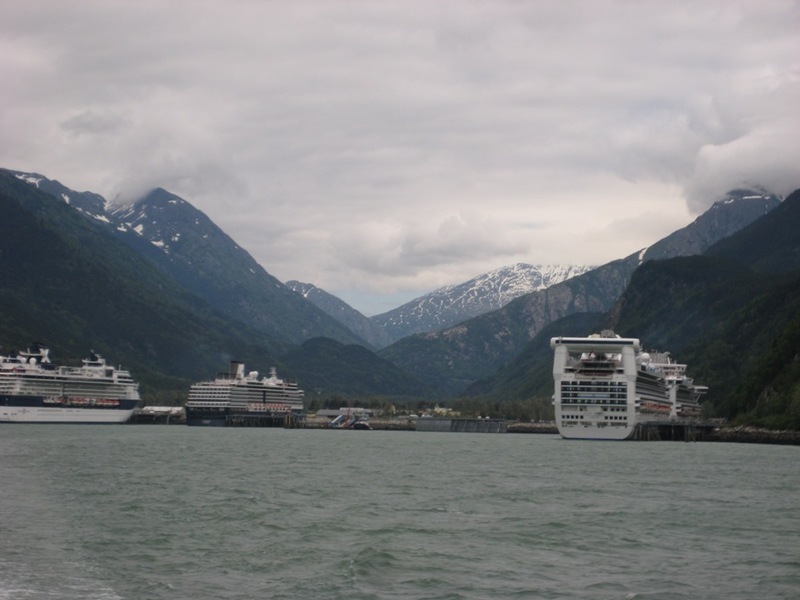 At one point on the excursion, some 17 miles into the mountains above Skagway, we looked over our shoulder and could see a view of Skagway Harbor with the cruise ships in the harbor. 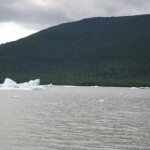 One cruise ship was on it’s way out of the harbor and we could see it moving through the Lynn Canal out into open water. What a sight! 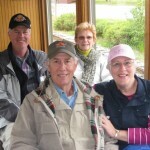 This railroad excursion was one of the highlights of our trip so far. 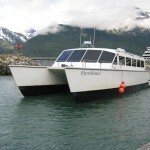 Tomorrow we will board the Fjord Express to Juneau. 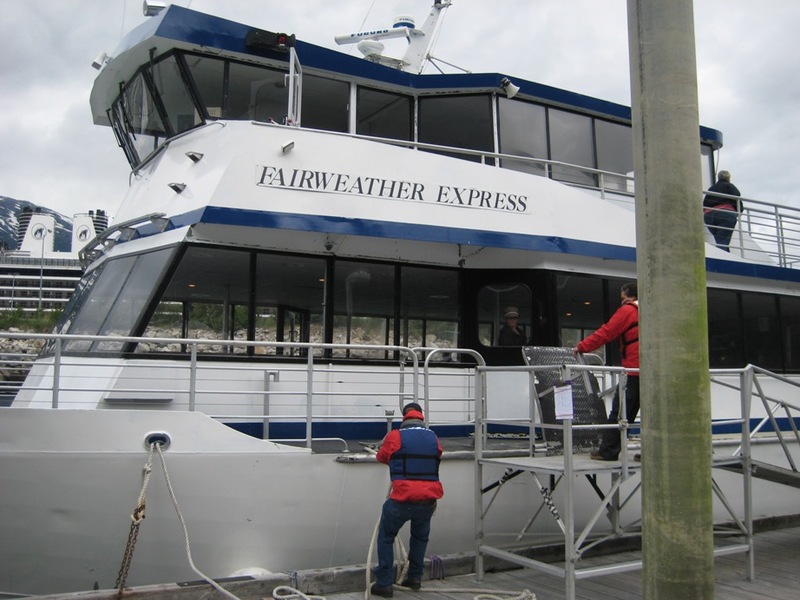 We will be on a 65 foot state of the art fast hulled catamaran. 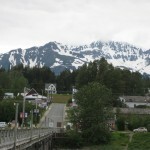 This will be an all day excursion to Juneau and while there we will take a bus to view the Mendenhall Glacier. 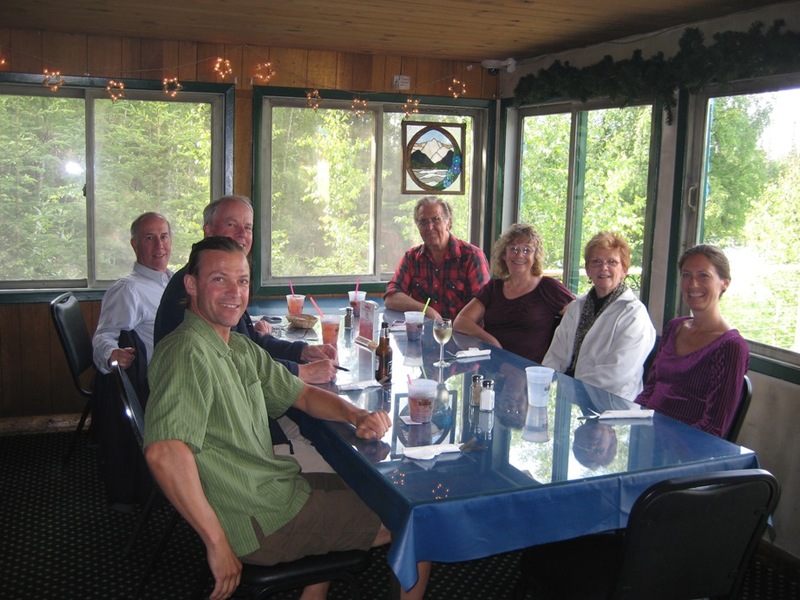 We had a great dinner last night in Skagway at a restaurant called “Skagway Fish and Chips”. 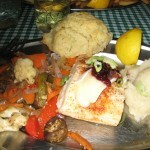 Fresh halibut was yummy. We had a great night’s sleep and awoke to a cruise ship’s horn. 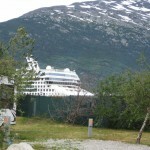 The cruise ship was docking in the harbor just yards away from our camp site. I can see the cruise ship from our window. 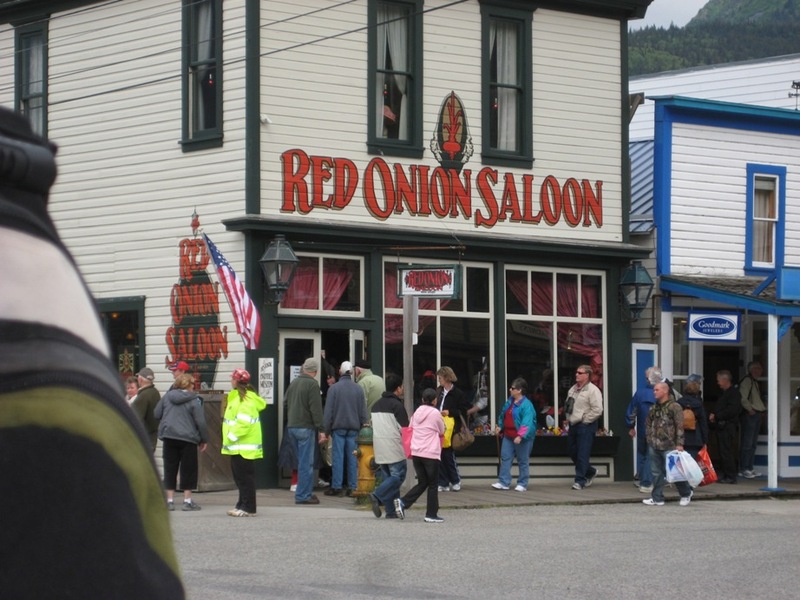 This is really a tourist town but so much fun because everyone is walking everywhere. The village is small so it’s easy to get around. 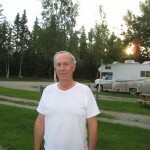 We had a great breakfast this morning of canadian bacon, eggs, juice, and coffee sitting at our dining table in the RV. We enjoyed watching the harbor activity. 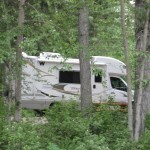 The campground is full with folks just like us. 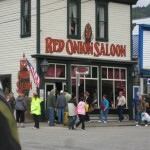 Before leaving for Haines, we walked into town to get our tickets for the White Pass Railroad trip we will take tomorrow evening. 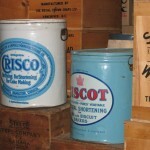 While in town this morning we shopped briefly at a couple of stores. We bought a pink ball cap for me (the word “Alaska” is in sequins across the front of the cap, I kid you not) You do crazy things when you are traveling! We bought a few more things and went into a diamond jewelry store where the salesman tried to sell us a $25,000 diamond ring. Guess he thinks all tourists have more money than they know what to do with. Ya gotta laugh…. 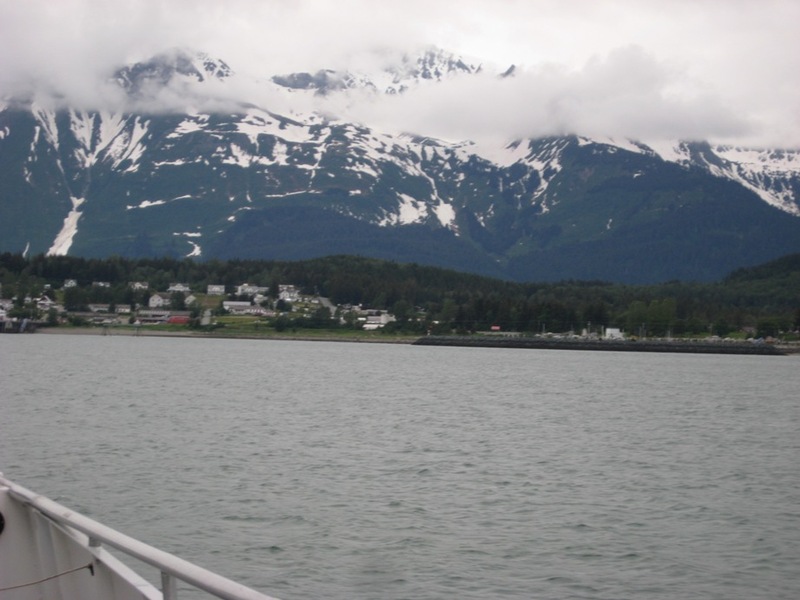 We left the dock at noon on our way to Haines. 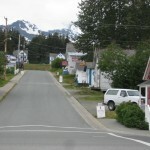 I struggle to find a word that describes Haines and I keep coming up with the word “quirky”. The people are very independent and could not imagine living anywhere else. 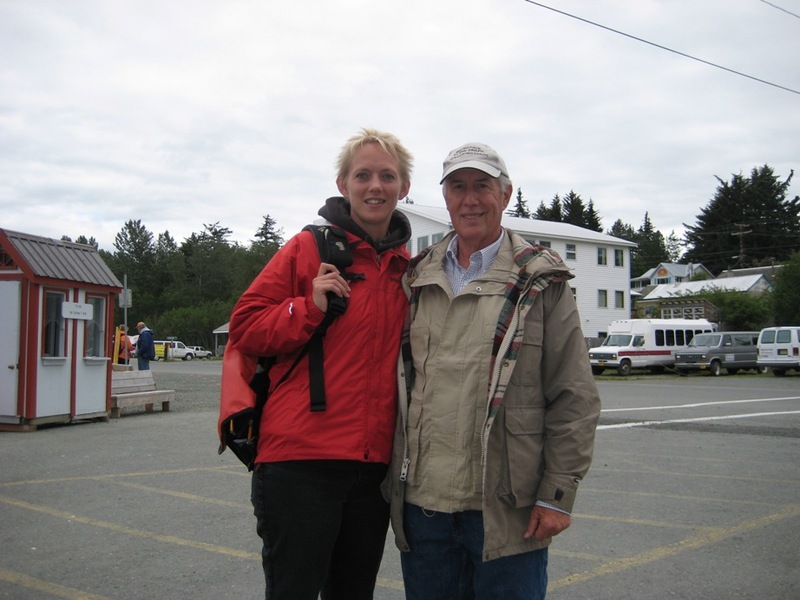 We met the captain of our ferry, Ellie, and she told us that she had lived here all her life, had married her childhood sweetheart, and they love their life in Haines. 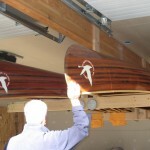 They also own a fishing charter boat and they work hard all summer “getting ready for winter”. They do not have television, by choice, and their children do not miss it. The children work with their parents in the summer. Ellie told us to be sure and visit the smoked salmon shop in town so we did just that. The lady who owns it was so good to give us samples of all the different smoked fish—king salmon, sockeye, etc. We bought several packages of different kinds of salmon. I have room in my freezer now to bring them home. They are shrink wrapped for easy storage. 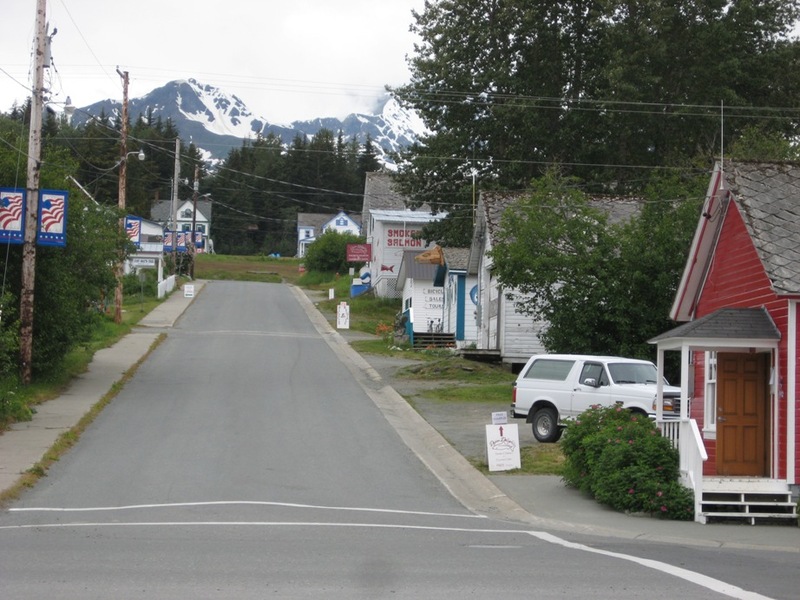 When we got off the ferry in Haines we found a little restaurant in town to have lunch. 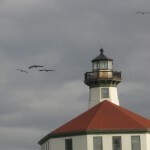 It was the Lighthouse Restaurant and we had a nice little lunch of chicken pesto pizza and caesar salad. We enjoyed our view right on the harbor from our table. We spent the afternoon visiting the little shops in the village. I bought a couple of pairs of earrings that are Russian Baltic amber. 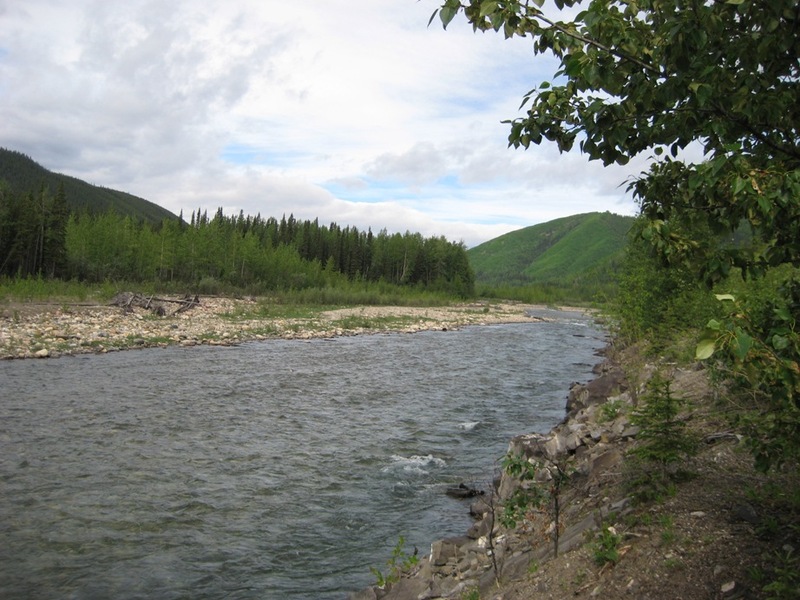 The Russians trade their baltic amber for some stone that is from this part of Alaska (can’t remember the name of the stone). 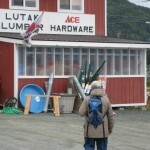 At any rate, you know I love to buy goodies while on this trip, and I can hardly get Greg to buy anything for himself. 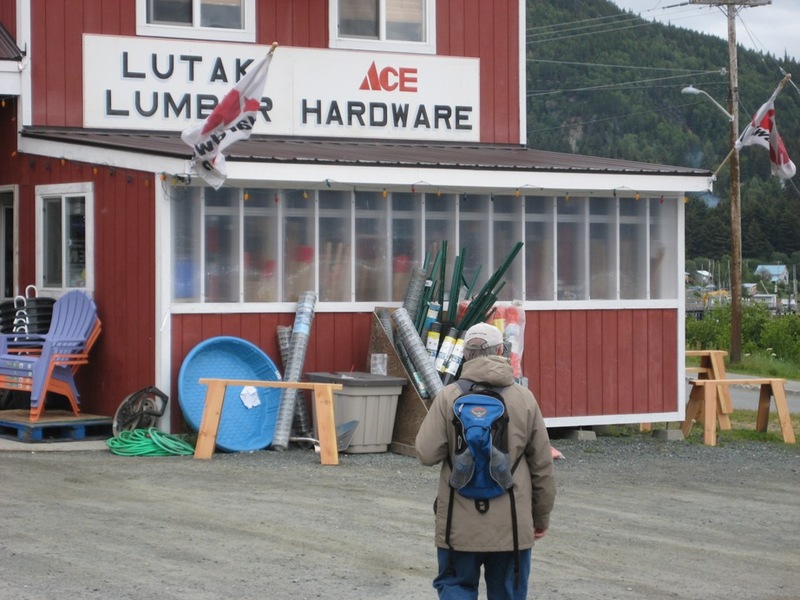 That is until he spotted an Ace Hardware store. He made a bee line for the store (see photo) and bought himself a hose clamp. The store was so crammed full of stuff Greg had a field day looking at it. The owner of the store led Greg through the store and up the stairs to where the clamp was stored. Greg was in hog heaven. So now he has a hose clamp from Haines, Alaska. 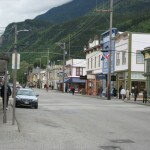 We arrived safely back in Skagway around 6:00 p.m and had a simple dinner of soup and sandwich. 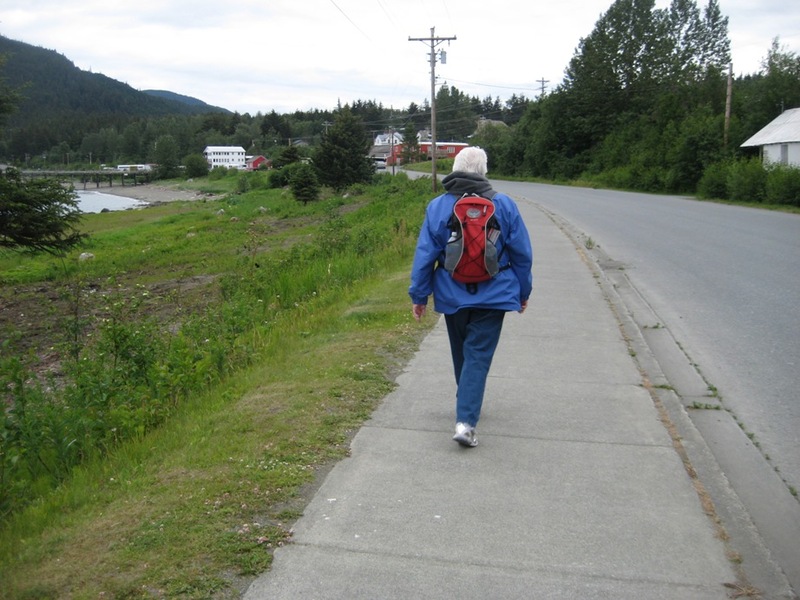 Don and Sandie had already visited Haines on another trip to Alaska, so they chose to hike this afternoon. 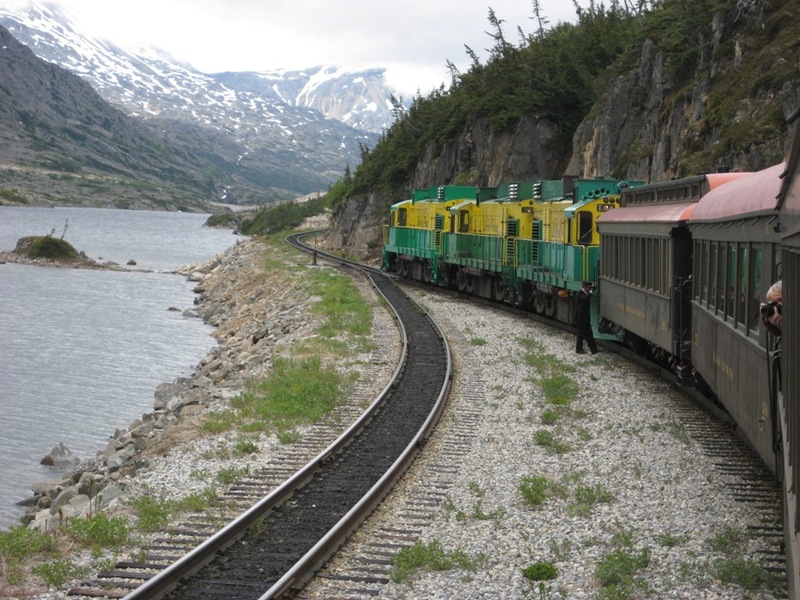 Tomorrow we will all board the White Pass Yukon narrow gauge railroad for an excursion up into the wilderness. 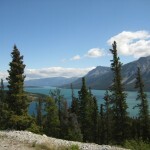 Our excursion leaves at 4:30 p.m. and lasts for 3 hours, so we will take a picnic supper with us. We know this will be a fun trip. 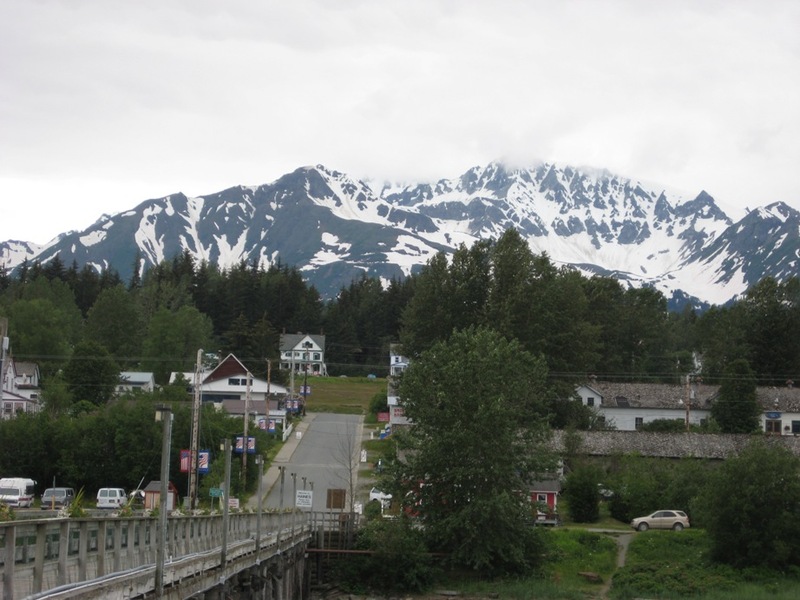 Tomorrow morning we will walk into Skagway to the Laundromat and do some laundry. I’ll work in a little shopping while we wait for the wash to be finished. We will mail a package to our granddaugher Olivia tomorrow morning also. We left our campground this morning at 8:30 a.m. It was 40 degrees and we had a cold evening but we stayed warm inside. 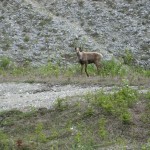 We spotted one brown bear this morning but no other wildlife today. We couldn’t get a photo because he appeared and disappeared before we could catch a shot of him. 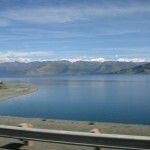 However we have had beautiful scenery around every turn. The weather has been very cold today. 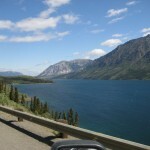 Lots of snow on the mountains and mountains and lakes are everywhere. 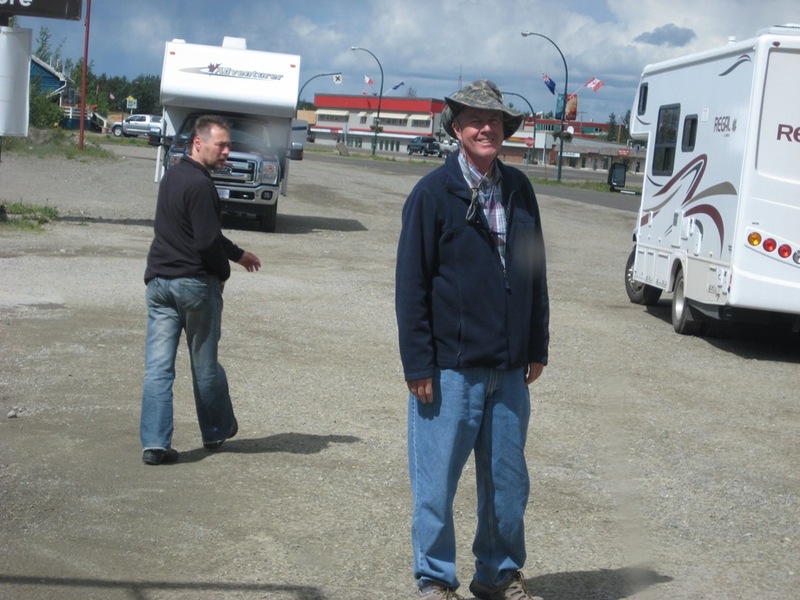 We stopped at a “restaurant, RV Park, hotel” called Dawson Peaks for a cup of coffee. The owner was very interesting and told us that he and his wife travel during the winter to places like Indonesia, India, Europe, etc. They bicycled through Austria last summer. Very interesting fellow. 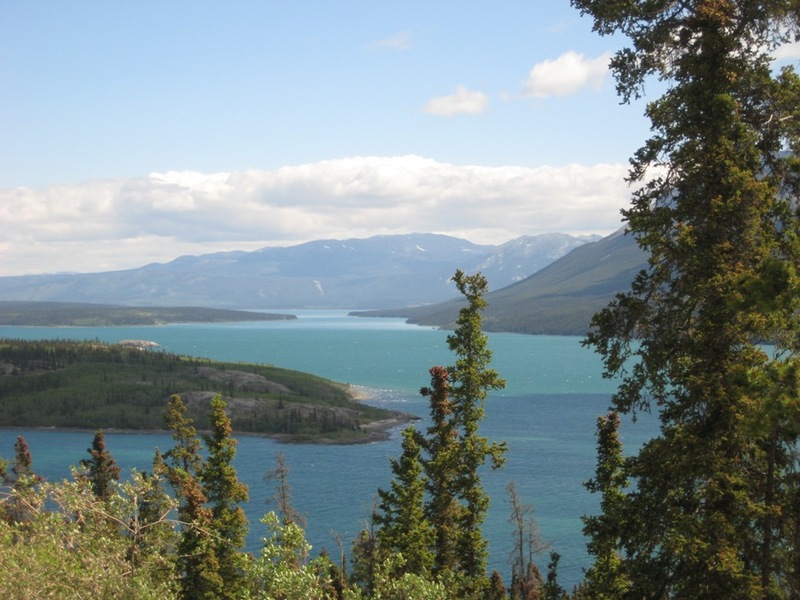 We turned onto a scenic route to Skagway which went through an area called Tagish. 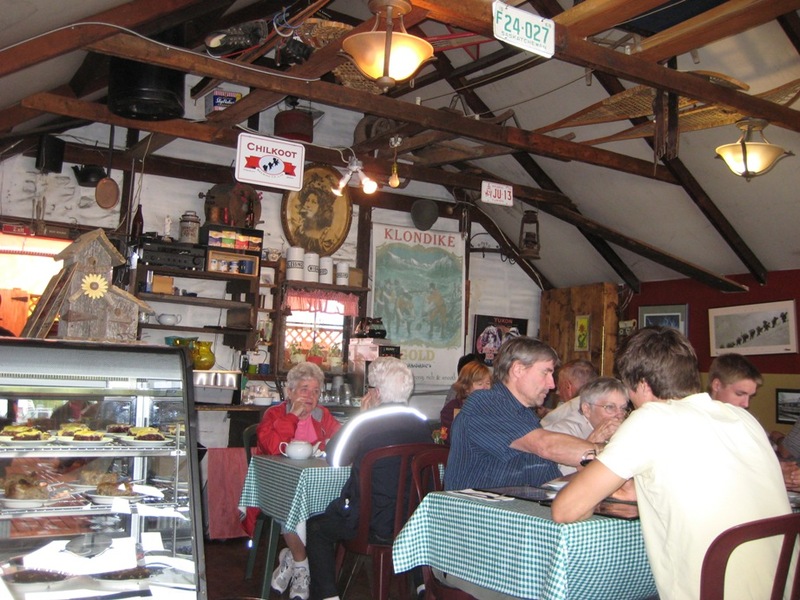 We found a little café in the Milepost in the middle of nowhere. 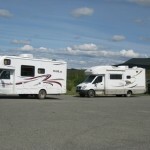 We decided to check it out and if it wasn’t clean we would just have a sandwich in our RV’s for lunch. 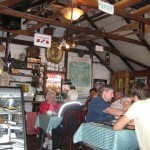 Well this was the neatest little café. The owners were German and the wife was just a lovely person. She had a pot of home made soup on and we ordered sandwiches to go with the soup. The soup was called “Farmer’s Vegetable”, and the base was a clear broth with vegetables in it. It was very hearty and the warm soup hit the spot. The sandwiches were also very good. The wife visited with us while we ate. We really enjoyed this stop off. There was a sign over the front door which said “We may not have it all together, but together we have it all”. That really says a mouthful, doesn’t it? We all really liked that sign. 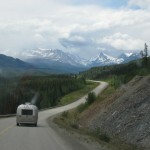 We turned 5,000 miles in Tagish on our way to Skagway. 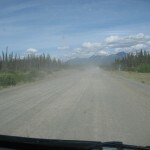 We were on dusty gravel roads today. You should see the RV now. It is really getting covered in dirt. 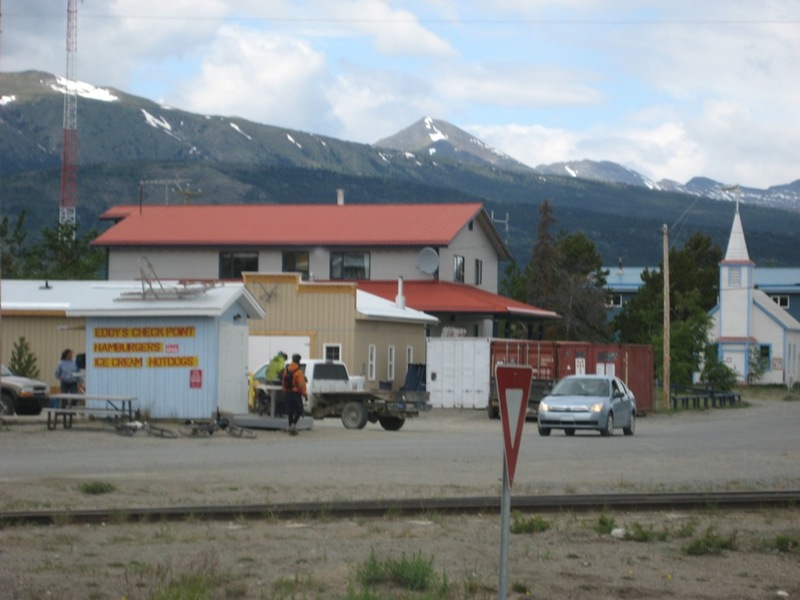 We stopped in a little village called Carcross. 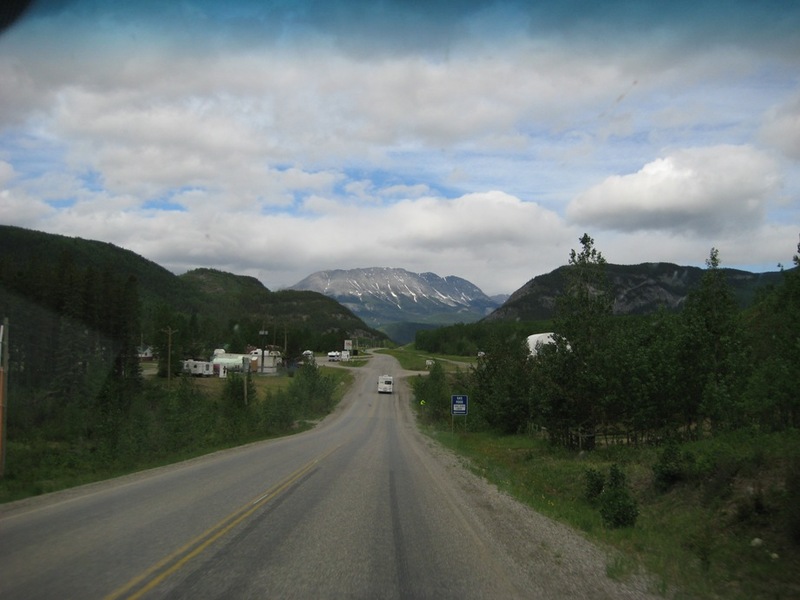 It was just a tiny village beside a river and looked very “Yukon”. Don bought a pan to pan for gold up near Chicken and we had a scoop of ice cream. 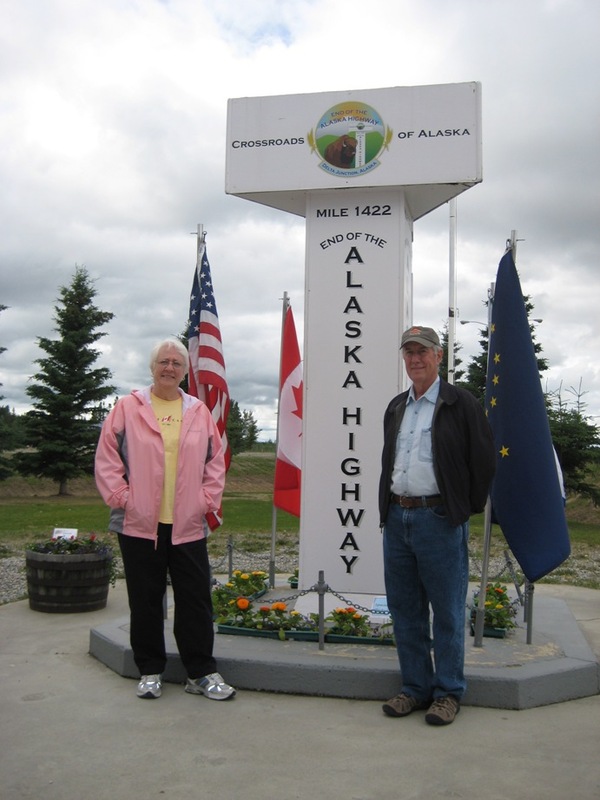 We crossed into Alaska and went through customs. They just checked the passports and that was it. 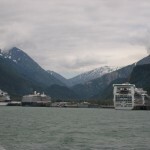 Entering Skagway gave us a dramatic view of the harbor filled with cruise ships. 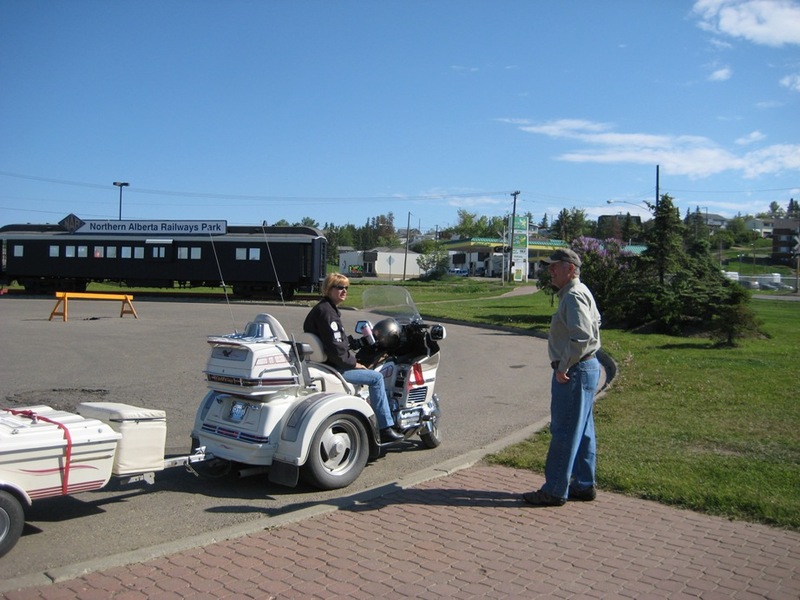 There will be many tourists here from the ships but we have a great RV park right on the harbor with the cruise ships in sight. 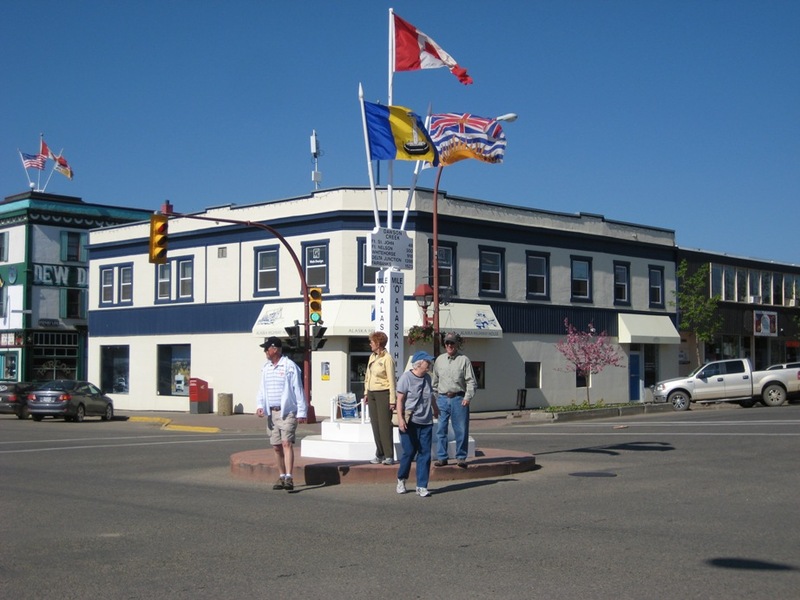 This is a walking town, meaning once you park, you do not need a car. 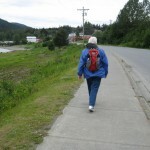 We are walking to a little restaurant tonight for fish and chips. 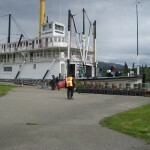 We will stay in Skagway four nights. 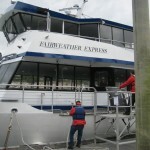 Tomorrow we plan on taking the Fast Ferry to Haines, Alaska, just for the afternoon. 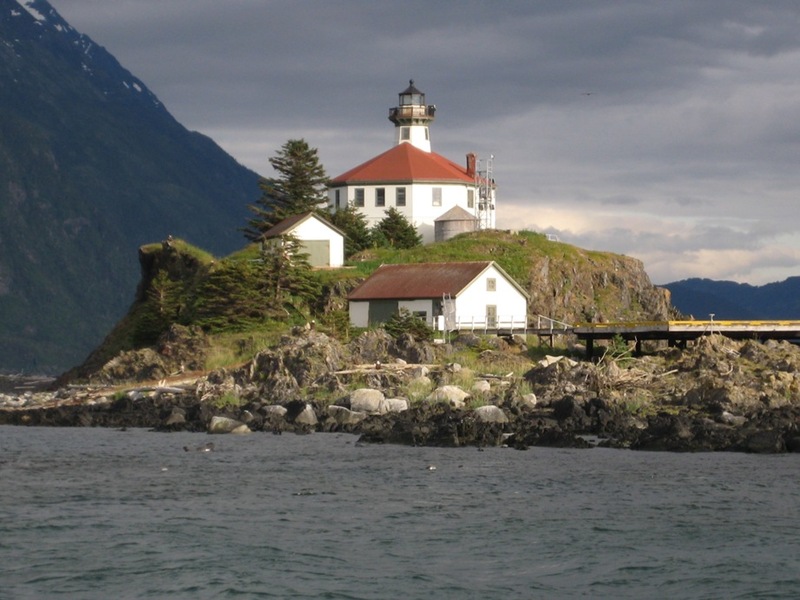 You can only reach Haines by water. 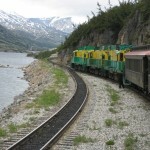 Wednesday we will take a trip on the famous White Pass Railroad which will take us back up into the Yukon. 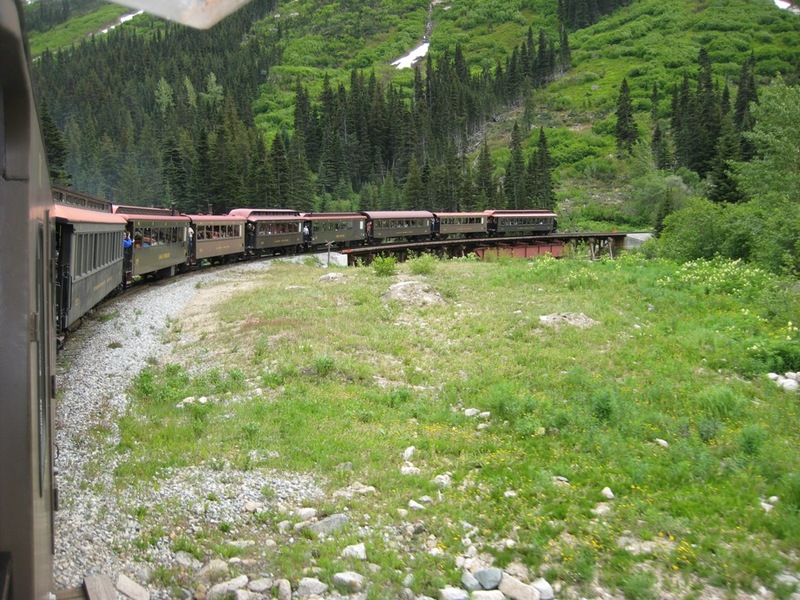 This is a narrow gauge railroad built in 1898 during the Klondike Gold Rush. 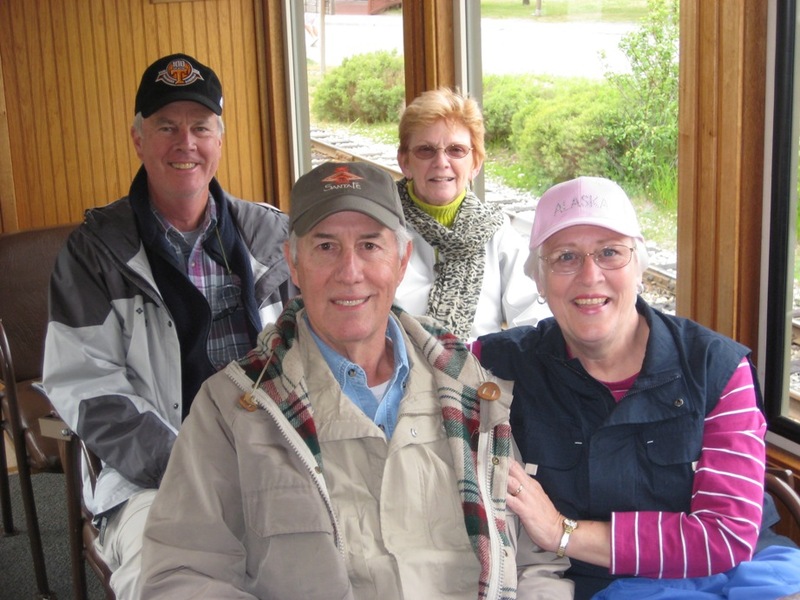 We will hear about the history of the gold rush while on the train ride. 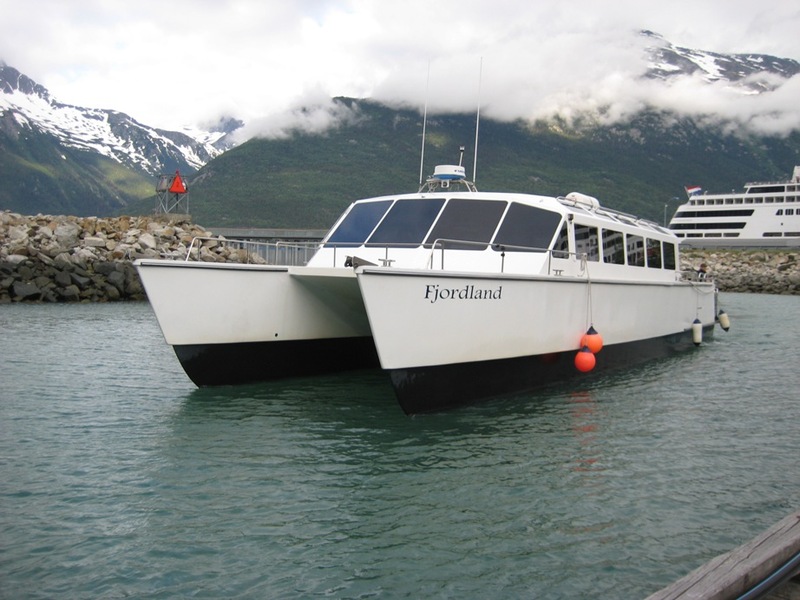 On Thursday we hope to take a day trip on the Fjord Express to Juneau. 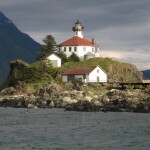 We can do some whale watching and visit Juneau, Mendenhall Glacier, and other sights on the Lynn Canal which runs between Skagway and Juneau. 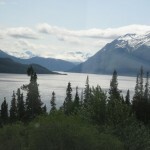 We are excited about our stay here in Skagway and will see lots of beautiful sights. 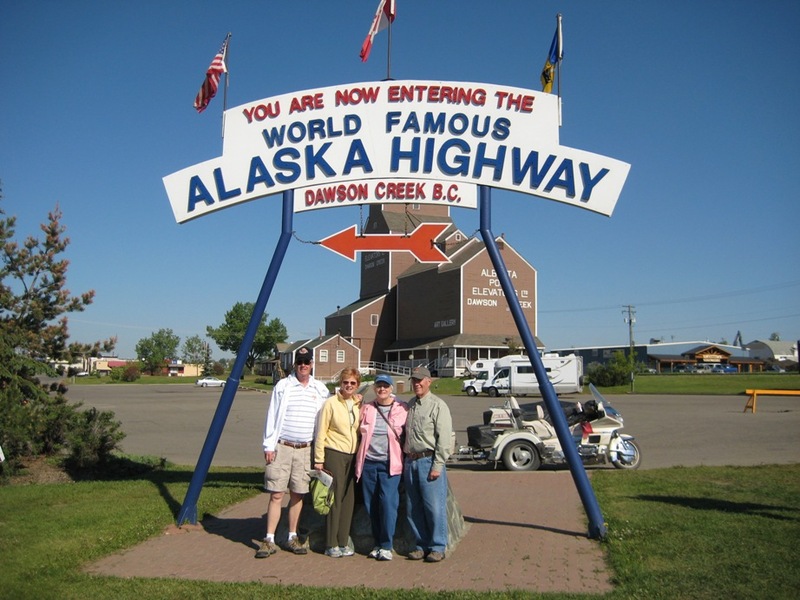 First of all let’s wish Don, our traveling buddy, a happy birthday. I won’t say how old he is, but let me say he looks really good for his age. His age is close to that famous Route 66. 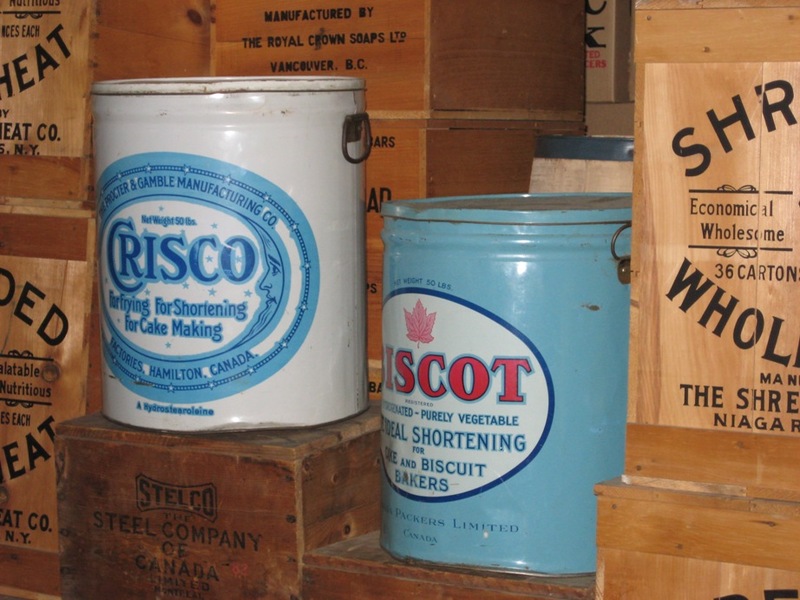 We’ve known him since he was a young buck of 27, starting his career at Procter and Gamble. 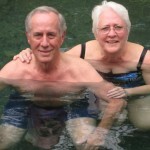 We had so much fun at Laird Hot Springs. Those springs are natural and boy were they hot. But it was really nice and the provential park next to the hot springs was such a nice park. It reminded me of the parks in the Smokey Mountains. Very shaded and quiet, since there are no utilities available. So for supper last night we had scrambled eggs, bacon, grits, and hot coffee. It was cool and damp so that was a perfect supper for us. We read our books by lantern light (thanks, Allan and Cat) and went to bed early. The night was quiet. Well we paid $6/gallon for diesel today. Seems the farther we get into the wilderness, the higher the gas prices. Whatever. 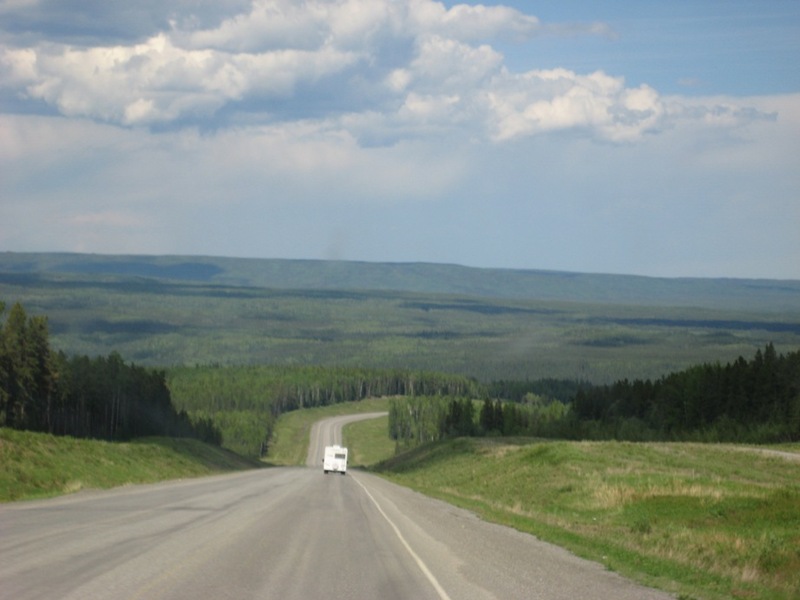 The Alaska Highway weaves between British Columbia and the Yukon today before we settle into the Yukon tomorrow. The scenery is so pretty — the photos just don’t do it justice. We were in several construction delays. As Werner always says, there are two seasons out here: winter and construction. 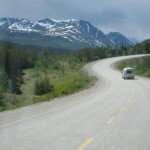 Allan and Ben, take a look at the roads we are on. Can you believe it? Dad is staying calm, though, because he knows it will get worse before it gets better. 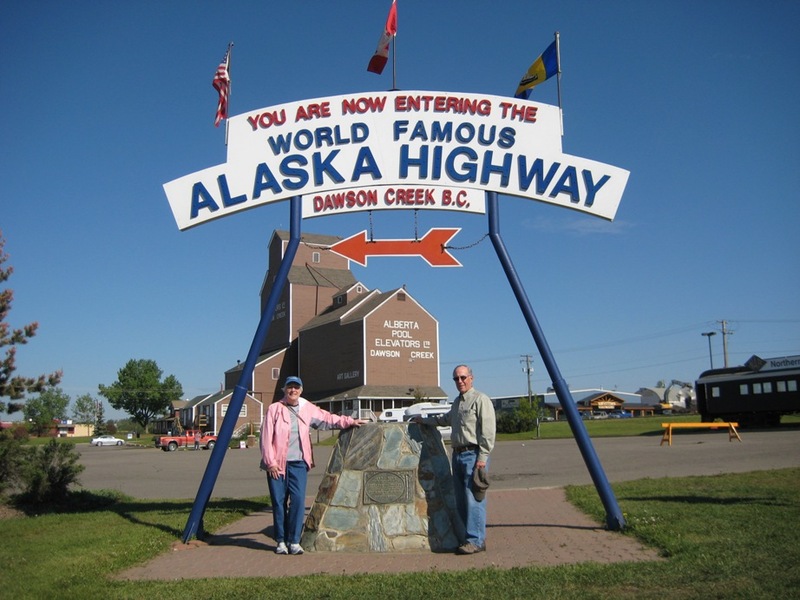 Sandie says we won’t believe the road to Chicken, Alaska. 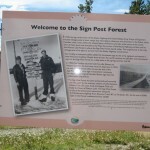 We stopped at Watson Lake at lunch time to visit the famous Sign Post Forest. 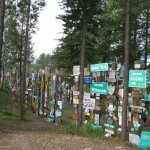 There are over 67,000 signs in the forest now, and we added one today. What a sight! 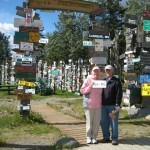 We saw signs from every country and every state and everything in between. We stopped for diesel and also groceries. Greg found a 1.85 liter of Breyers ice cream and the cost was $11.99. You know he’s not going to get that ice cream. It hailed on us although the temperature was 53 degrees. The wind chill was on down there though. We are running into the same folks over and over again at the different stops. 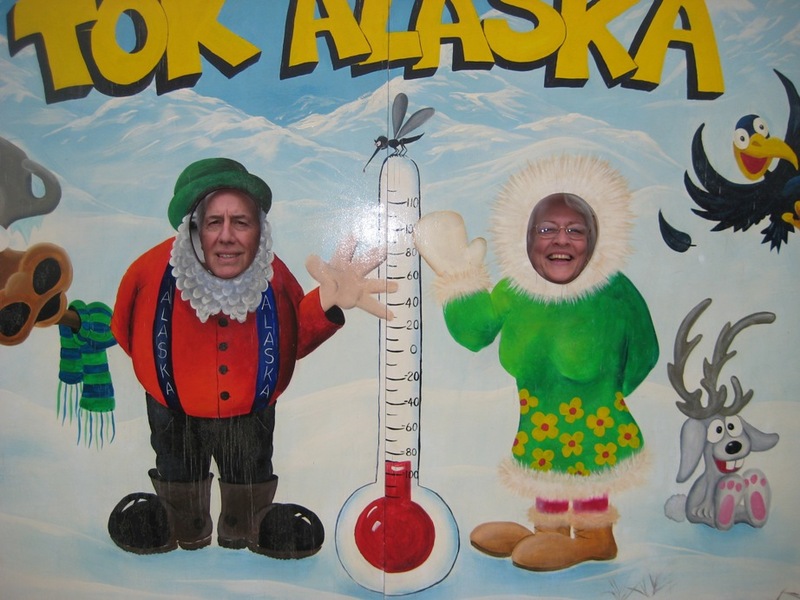 Guess we are all on the same route going to Alaska. 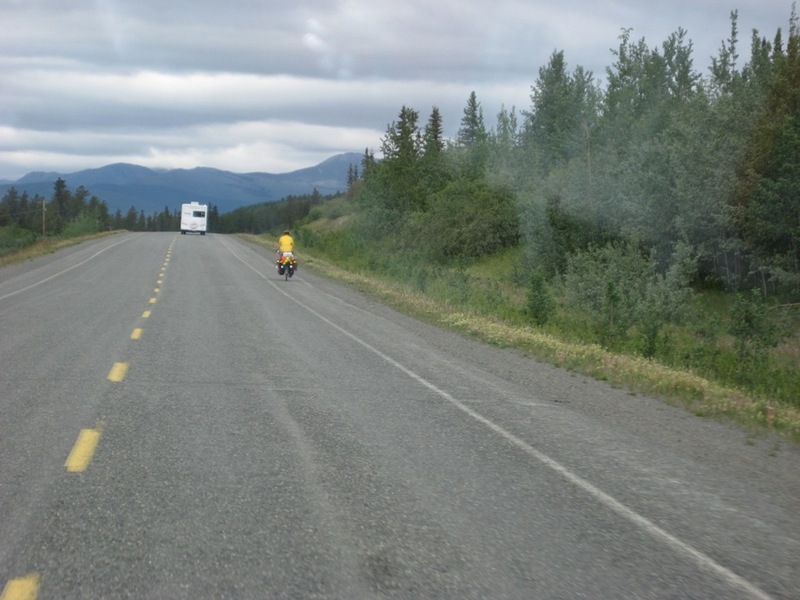 We see each other on the road, pass each other, and everyone blows the horn and waves. 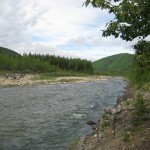 We are spending the night in Swift River, Yukon territory. We have hookups so we are getting some wash done in the laundry and we have WiFi. We are really enjoying ourselves and feel good every day. 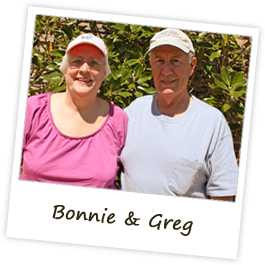 So glad you are all enjoying our web site and we really enjoy your comments. 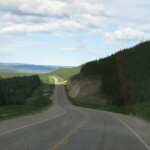 We left this morning early because we wanted to get 200 miles up the road to Laird Hot Springs. 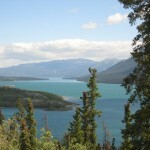 This is a natural hot springs and it is a “must visit” on your way to Alaska. Also there is a wonderful provential park at the springs and if you don’t arrive early in the day you will not find a campsite. 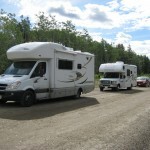 We arrived around noon and were able to get two sites close together. This park is very rustic, with no electricity, water, etc. But we are self contained so we can manage this fine. Tomorrow starts our second month on the road. It’s hard to believe we’ve been gone a month already and we are so far from home. 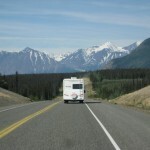 It took us a few days to acclimate to living in the RV, but now we are really on a roll. We can set up and take down our bedding in 10 minutes. We have everything we need with us. It’s all working out well. 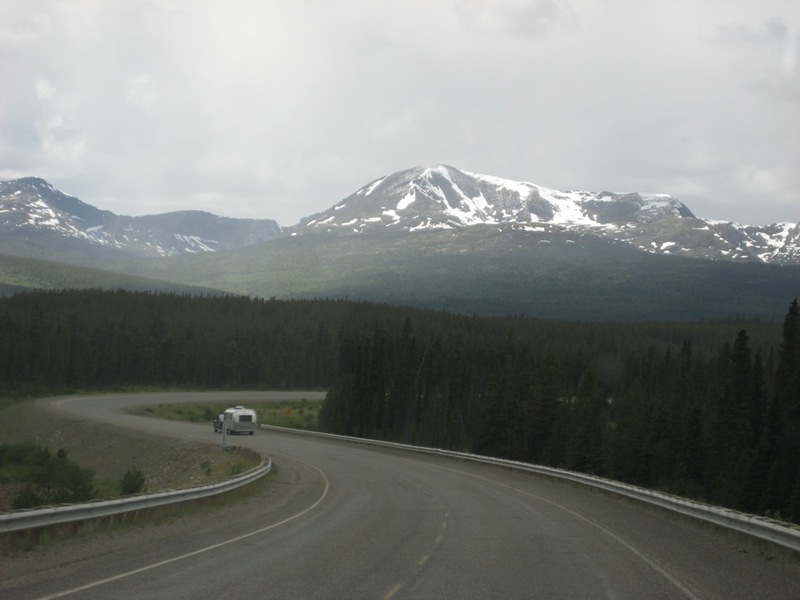 This part of the Alaska Highway is very wild. 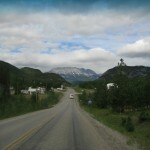 There are no facilities between villages, and heck, there were no villages between Fort Nelson and Laird Hot Springs. 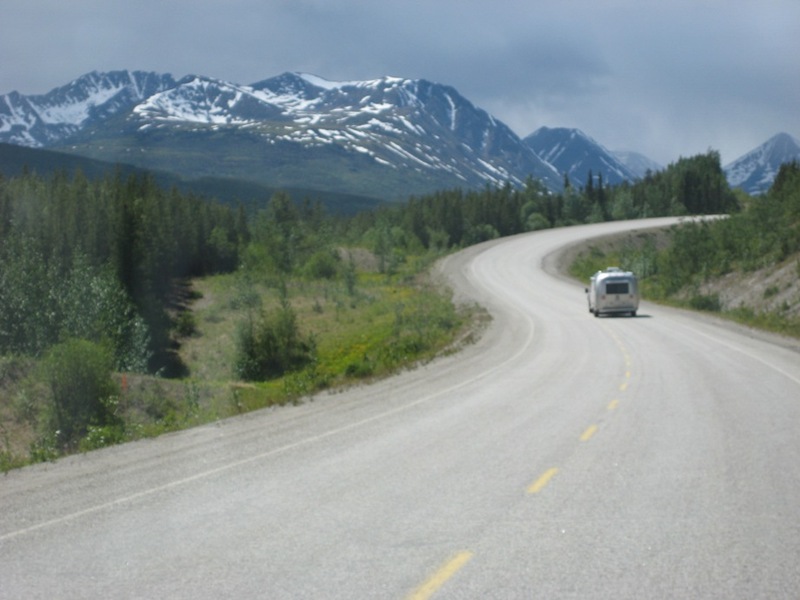 You better have a full tank of gas before starting out and never ever run low on fuel. There are usually signs on the road when you leave one village telling you how far you are from the next facilities. 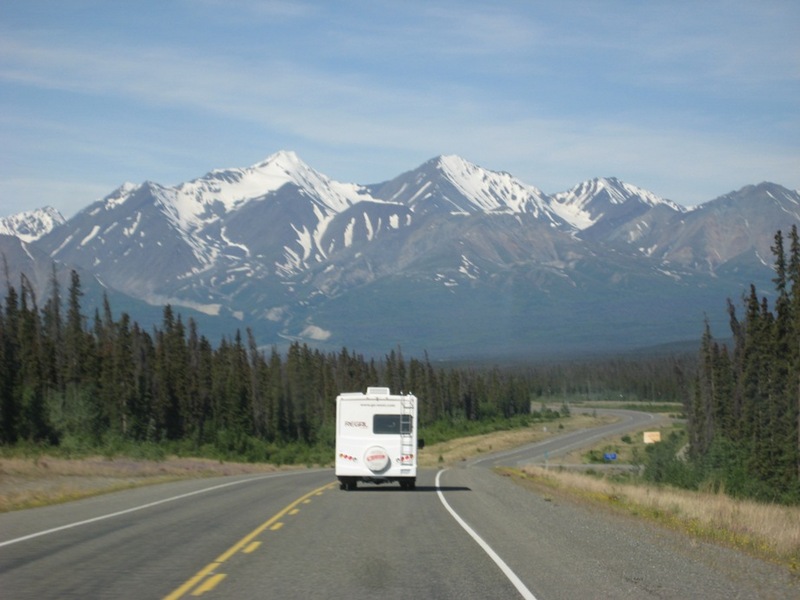 There are no “rest stops” on the road, either. 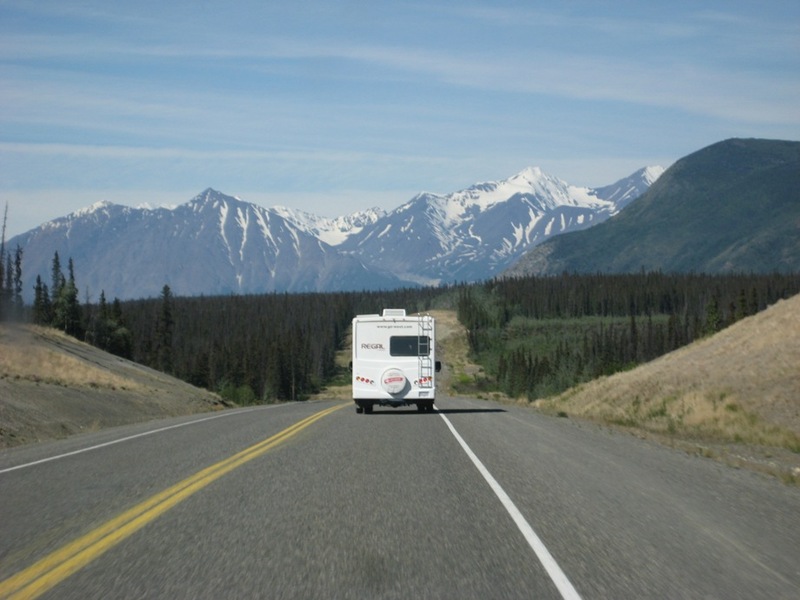 I can’t imagine doing this trip in anything but an RV. There are pull offs every so often that you can take advantage of. 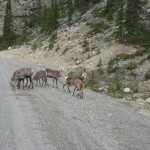 We’ve seen two or three bears today, a couple of moose, and some stone sheep. 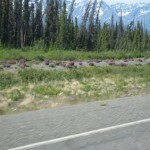 The sheep are pretty easy to photograph, but the bears are difficult. They don’t stand around long. 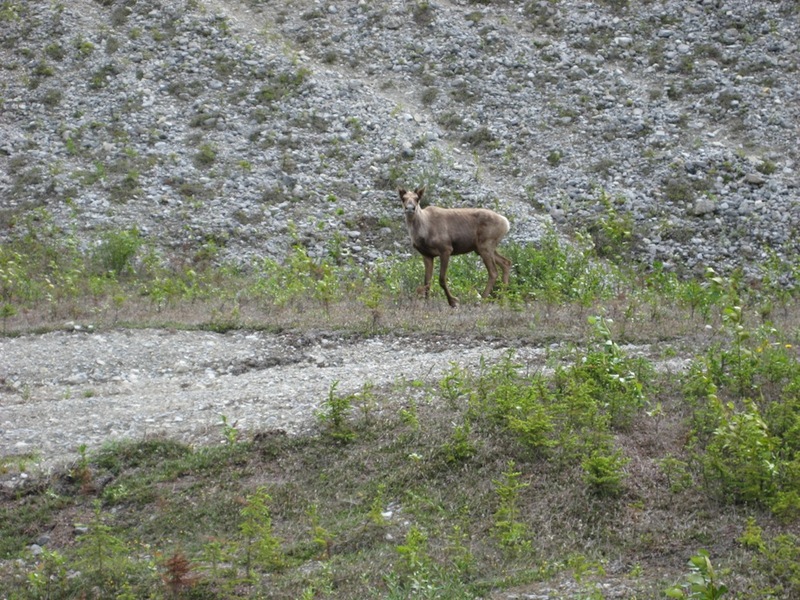 Moose and sheep stand around for the most part. The roads today were so rough our kitchen drawers flew open on occasion. Not to worry—Greg brought painters blue tape so we taped the drawers and wardrobe and it seemed to do the trick. There is so much to see I usually travel with a camera in one hand and the walkie talkie in the other. 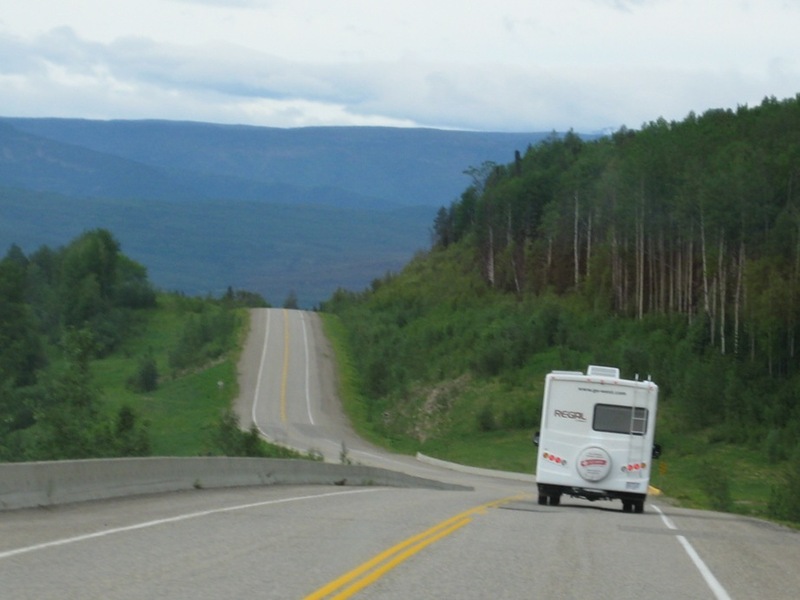 If Don and Sandie are ahead of us, they radio us the location of the wildlife and by the time we get there, we can usually get a good glimpse of whatever it is. 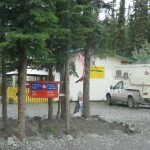 Now back to the Laird Hot Springs. 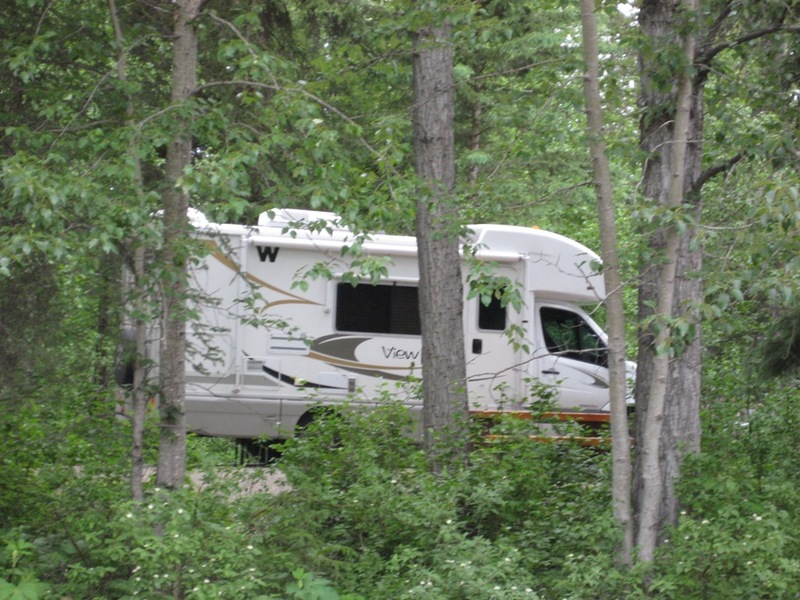 From our campsites, we can walk the distance back into the woods to the hot springs. The wooden walkway goes across wetlands until you get to the pools. There are two separate springs, one is deeper than the other. We stayed in the more shallow springs. 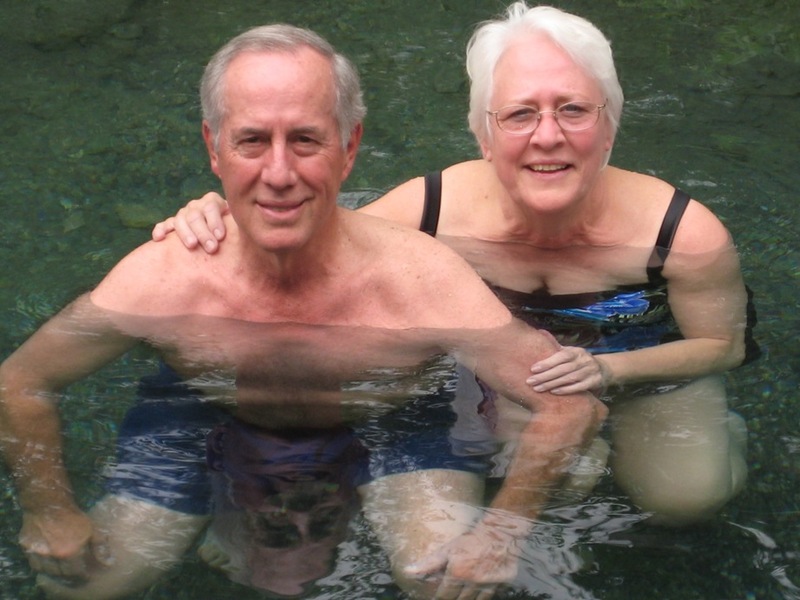 The warning sign said not to stay in the springs longer than 20 minutes at a time due to the high temperature. 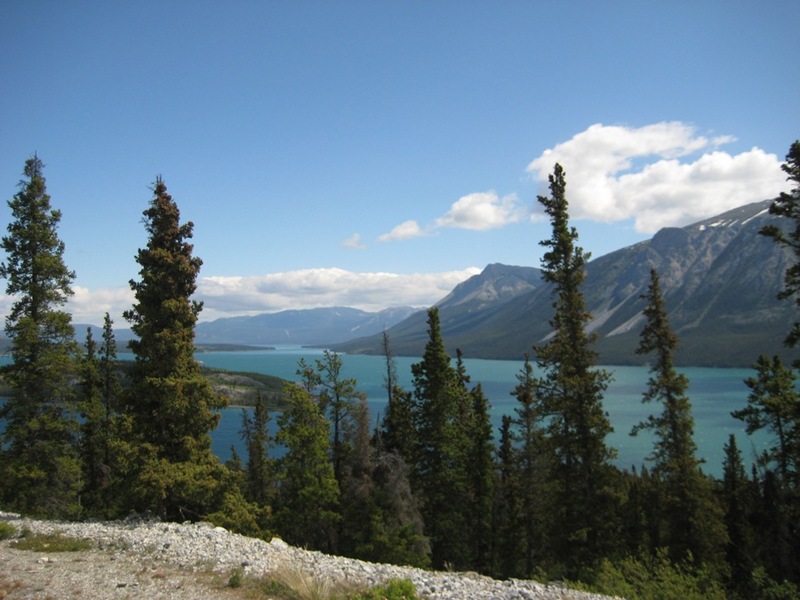 The temperature of the springs ranges from 106 degrees to 126 degrees. In some spots it was almost too hot to stand still. Swirling the water around seemed to help. After 20 minutes in the water you feel weak, as if you were in a sauna. We enjoyed it thoroughly. After a quick walk back to the campsite, we took a short nap. It’s quiet as can be here in the wilderness with no distractions. Tonight will be a good sleep. 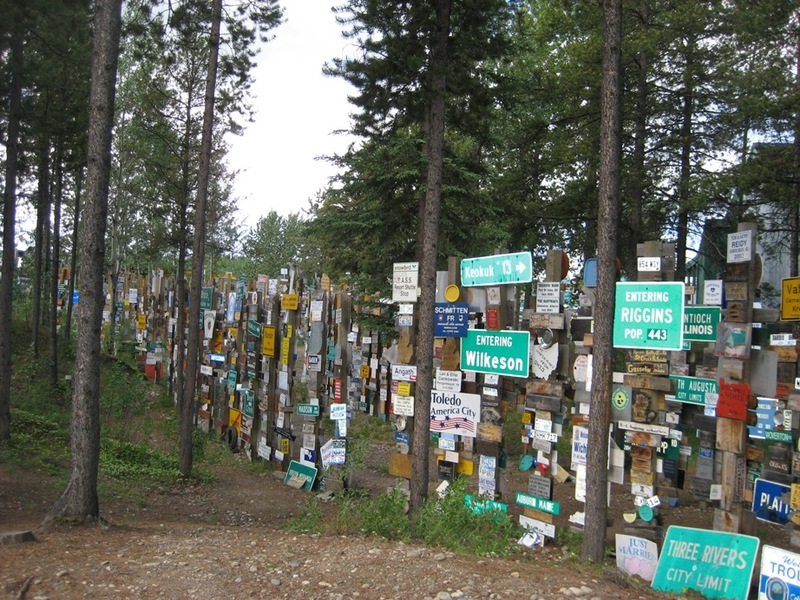 Tomorrow we head toward Watson Lake, where the famous “Signpost Forest” is located. 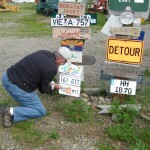 We brought an old Hamilton County license plate to nail to a post. 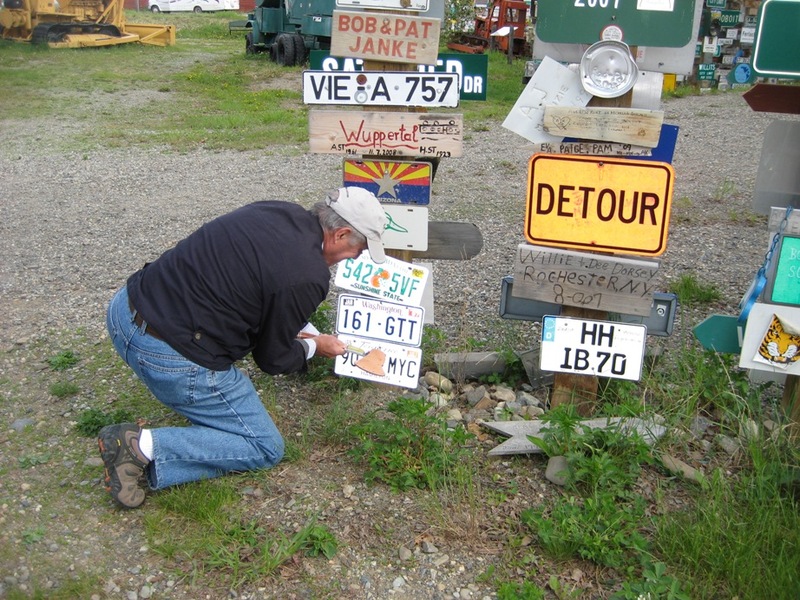 My mom and dad did the same thing 30 years ago and I would sure love to come upon an Elbert County Georgia license plate. But since there are literally thousands in the forest, it’s not likely.